The Anticipation arising from the previous season was not misplaced. 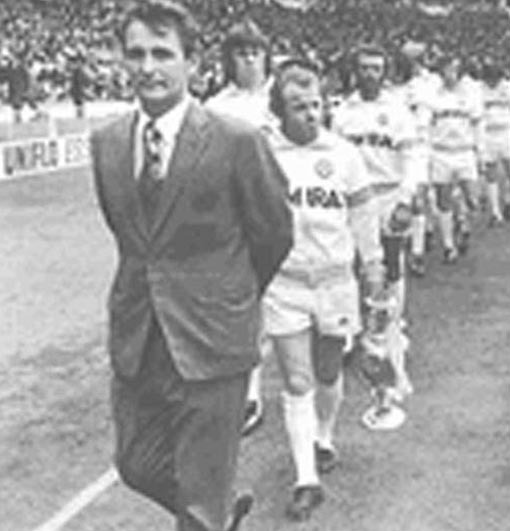 A Don Weston goal ensured victory over Rotherham United at Elland Road on the season’s opening day. 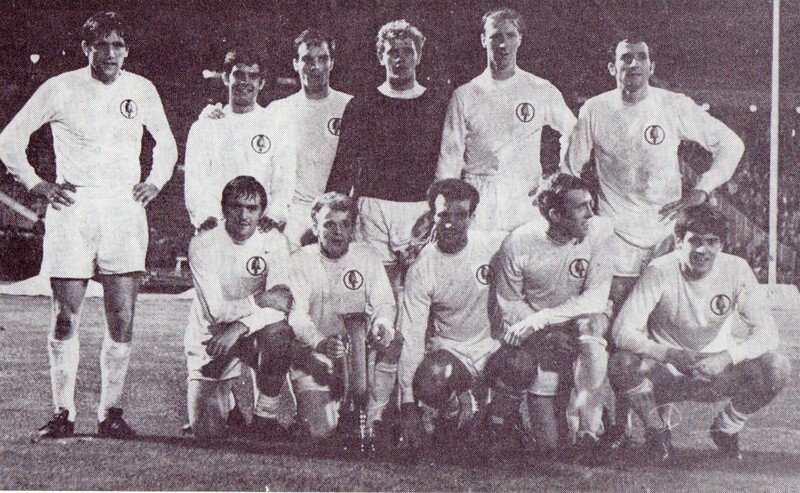 The Team was Sprake; Reaney, Bell; Bremner, Charlton, Hunter; Weston, Storrie, Lawson, Collins, Johanneson. 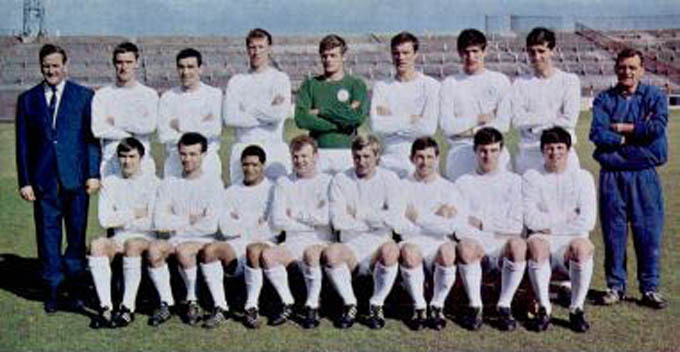 £33,000 capture from Man United, Irish International Johnny Giles replaced Ian Lawson and with the £50,000 late acquisition of the immaculate English International Alan Peacock apart, the team largely kept the same formation and personnel. Their colours were lowered only three times, at promotion rivals Manchester City (6th) Sunderland (2nd) and Preston (3rd). Norman Hunter (42) was ever-present, with Gary Sprake, Paul Reaney and inspirational Captain Bobby Collins (41) missing only one game and had strong support from Johnny Giles (40) Billy Bremner (39), Albert Johanneson (37) Don Weston and Willie Bell (35). Injuries restricted Jack Charlton (25) and Jim Storrie (15), which enabled Freddie Goodwin (12) and Ian Lawson (24) to show their value. 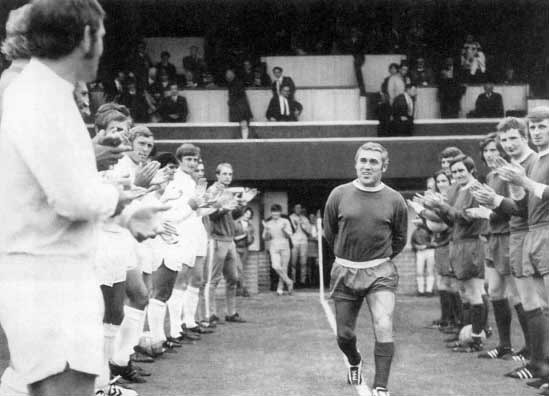 Alan Peacock showed his worth with 8 goals in 14 games and United were quite happy to pay a further £5,000 to Middlesbrough, as his efforts ensured promotion.Jimmy Greenhoff, Terry Cooper and Paul Madeley were blooded and Peter Lorimer played in the League Cup. Albert Johanneson and Don Weston led the goalscorers with 13 each. 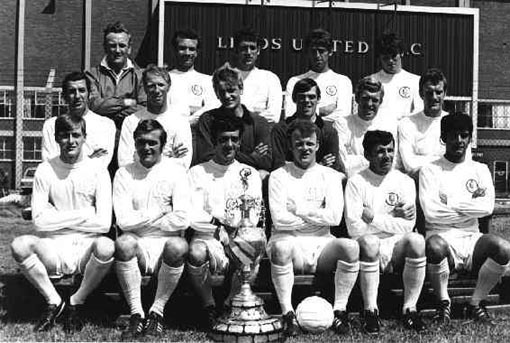 With the kind permission of Mr. Colin S. Jeffrey, MOT are happy to acknowledge his fine 12 Years at the Top, the story in words and pictures of Leeds United’s great years 1963-1975 as being the definitive version of the period. 62 Competitive Games Played! 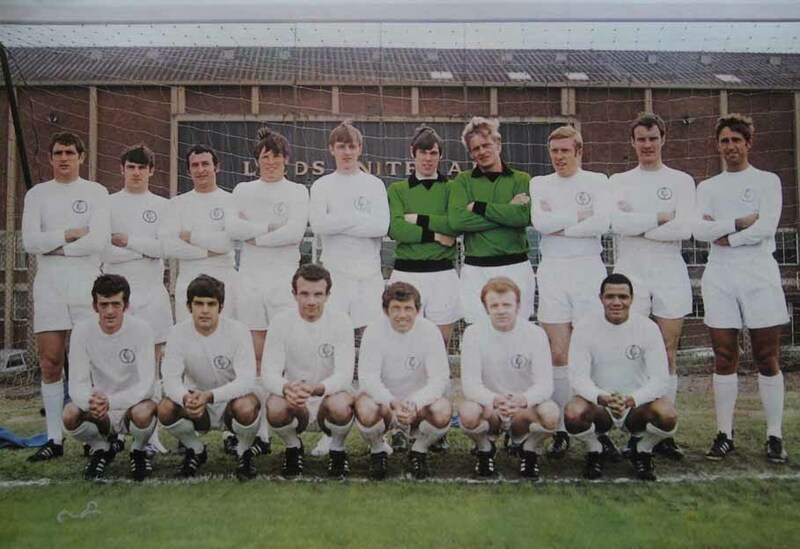 Bremner 55, Charlton 51, Clarke 43, Cooper 50, Giles 50, E.Gray 45, Hunter 51, Jones 53, Lorimer 58, Madeley 59, Reaney 55, Sprake 54 – and only one substitute allowed (in case of injury) !! 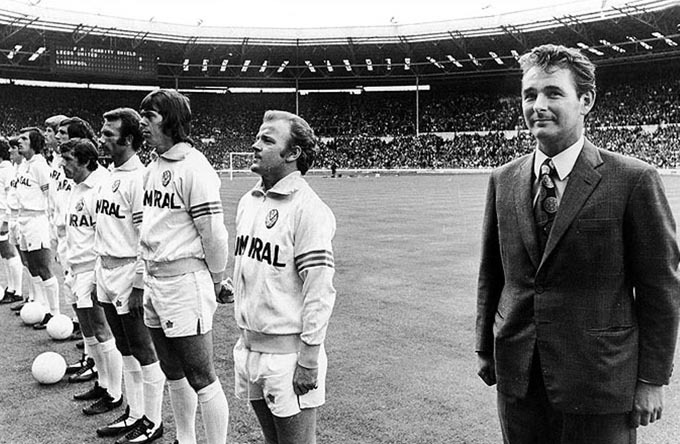 Revie is welcomed by Derek Mayers, Colin Grainger, Peter McConnell, Gerry Francis, Grenville Hair, Jack Charlton and Jimmy Ashall while three others look on. 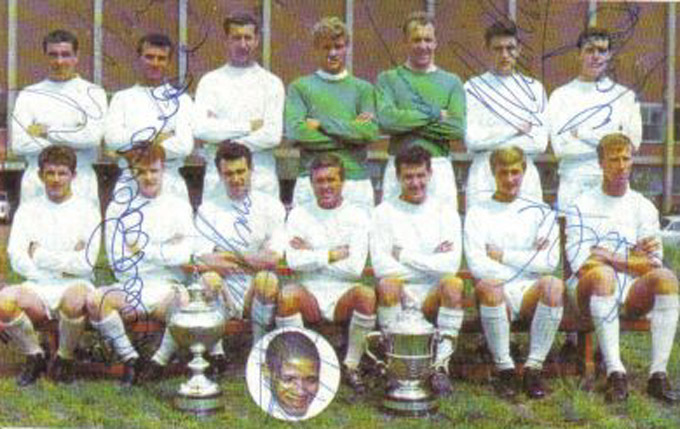 Back Row: Grenville Hair, Paul Reaney, Gary Sprake, Jack Charlton, Willie Bell, Norman Hunter. 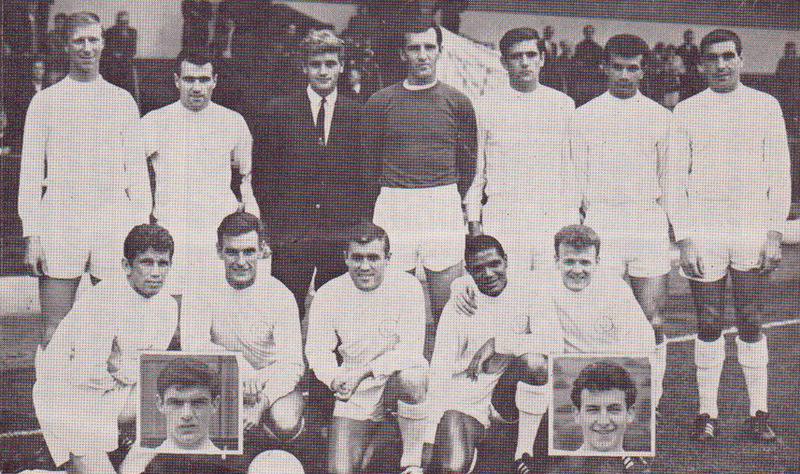 Front Row: Tommy Henderson, Albert Johanneson, Jim Storrie, Bobby Collins, Billy Bremner. Back Row: Terry Hibbitt, Jimmy Lumsden, Bobby Sibbald, David Harvey, John Price, Mick Bates, Dennis Hawkins. Front Row: Graham Smith, Eddie Gray, Jimmy Greenhoff, Barrie Wright, Peter Lorimer, Nigel Davey, Derek Ryder, Rod Belfitt. 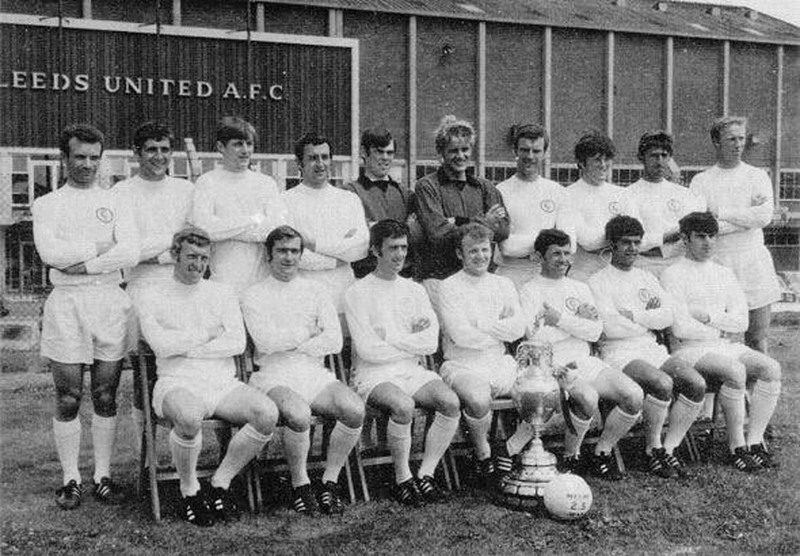 Back Row: Don Weston, Norman Hunter, Paul Madeley, Gary Sprake, Willie Bell, Billy Bremner, Barrie Wright. Front Row: Albert Johanneson, Paul Reaney, Bobby Collins, Ian Lawson, Johnny Giles. Back Row: Don Weston, Grenville Hair, Paul Reaney, Gary Sprake, Brian Williamson, Jack Charlton, Norman Hunter, Cliff Mason. 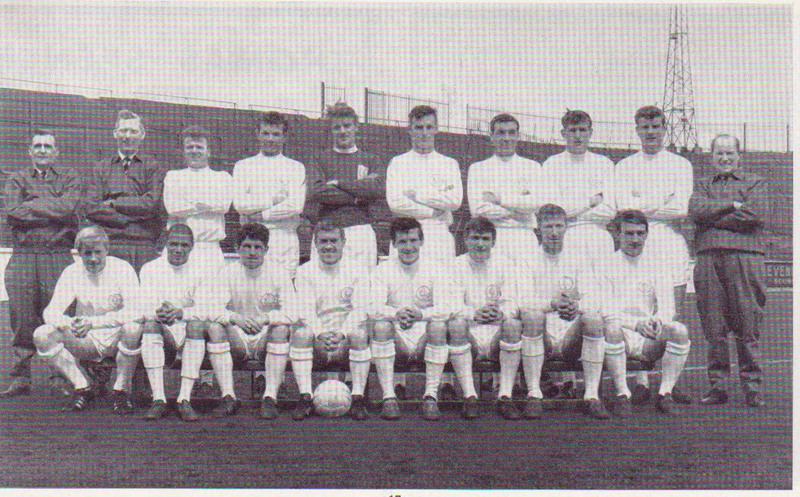 Front Row: Eric Smith, Ian Lawson, John Hawksby, Jim Storrie, Tommy Henderson, Billy Bremner, Willie Bell. Inset: Bobby Collins, Albert Johanneson. 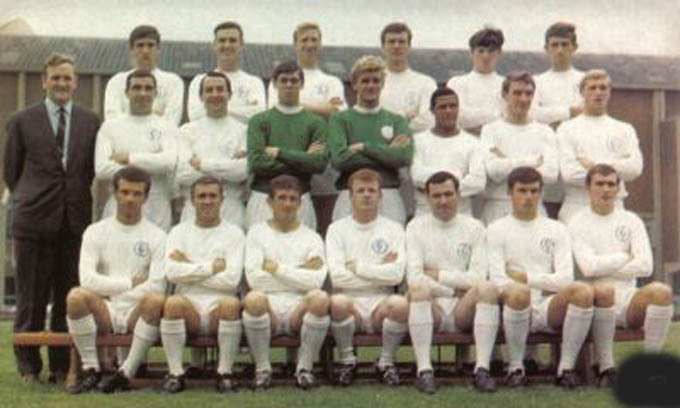 Back Row: Billy Bremner, Paul Reaney, Gary Sprake, Jack Charlton, Norman Hunter, Willie Bell. 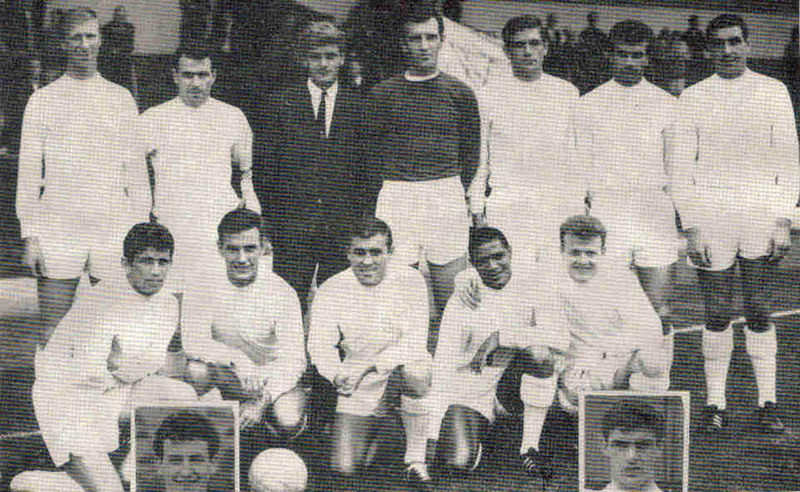 Front Row: Johnny Giles, Don Weston, Bobby Collins, Alan Peacock, Albert Johanneson. 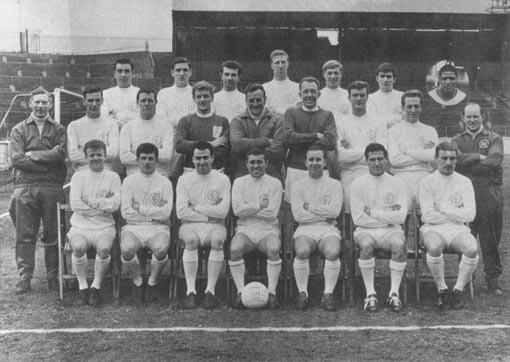 Back Row: Don Revie (Manager), Billy Bremner, Grenville Hair, Norman Hunter, Freddie Goodwin, David Harvey, Jack Charlton, Willie Bell, Paul Reaney, Les Cocker (Trainer). 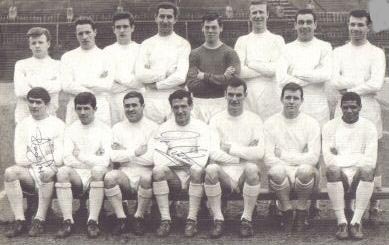 Front Row: Terry Cooper, Johnny Giles, Bobby Collins, Don Weston, Alan Peacock, Ian Lawson, Albert Johanneson. 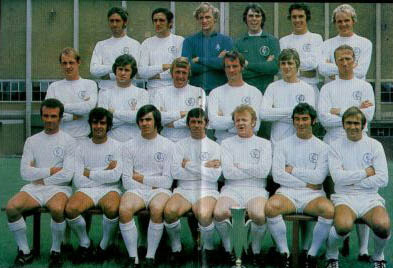 Back Row: Billy Bremner, Grenville Hair, Norman Hunter, Freddie Goodwin, David Harvey, Jack Charlton, Willie Bell, Paul Reaney. 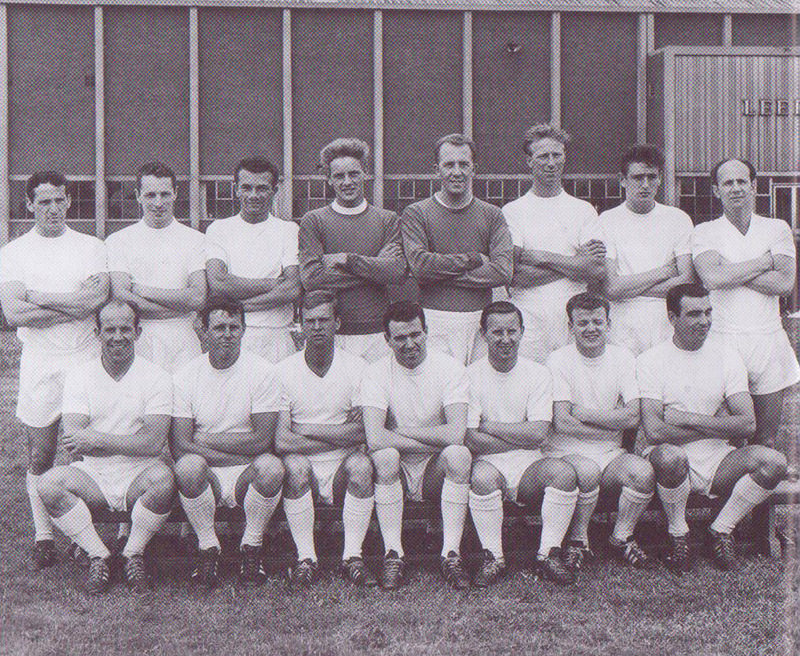 Back Row: Willie Bell, Paul Reaney, Freddie Goodwin, Gary Sprake, Brian Williamson, Norman Hunter, Ian Lawson. 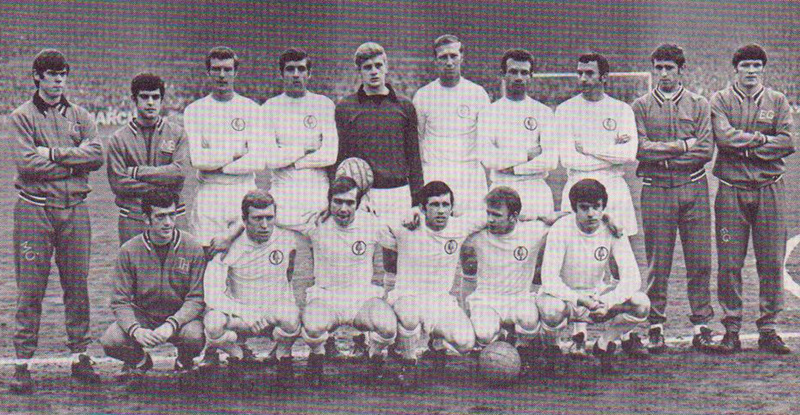 Front Row: Johnny Giles, Billy Bremner, Jim Storrie, Bobby Collins, Don Weston, Jimmy Greenhoff, Jack Charlton. Inset: Albert Johanneson, Alan Peacock. 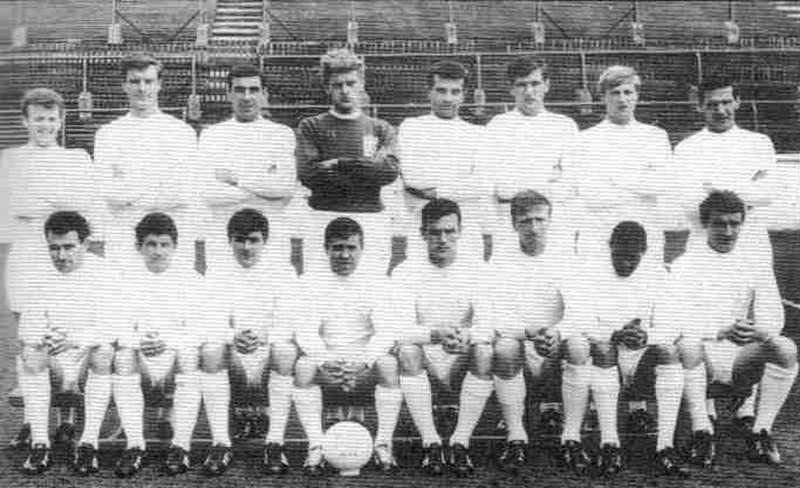 Front Row: Johnny Giles, Billy Bremner, Jim Storrie, Bobby Collins, Don Revie (Manager), Don Weston, Jimmy Greenhoff, Jack Charlton. Inset: Alan Peacock, Albert Johanneson. 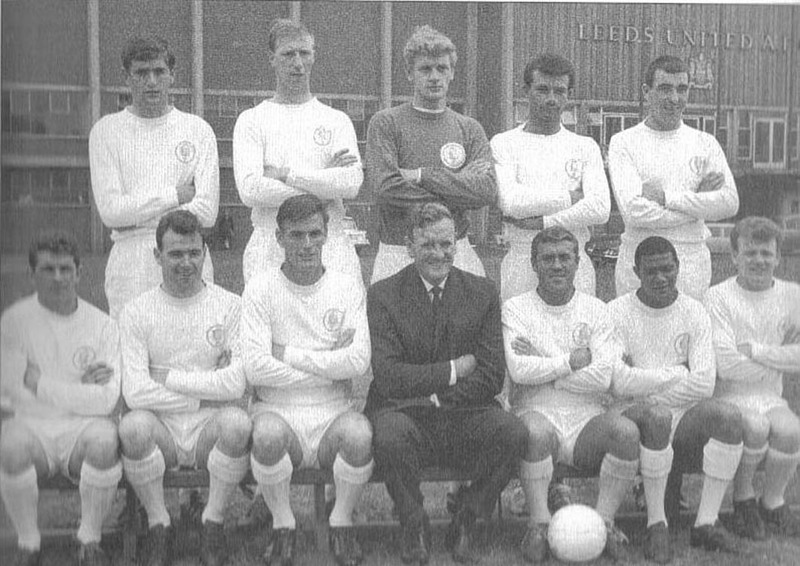 Back Row: Don Revie (Manager), Billy Bremner, Grenville Hair, Norman Hunter, Freddie Goodwin, Gary Sprake, Jack Charlton, Willie Bell, Paul Reaney, Les Cocker (Trainer). Back Row: Willie Bell, Norman Hunter, Paul Reaney, Jack Charlton, Jimmy Greenhoff, Terry Cooper. 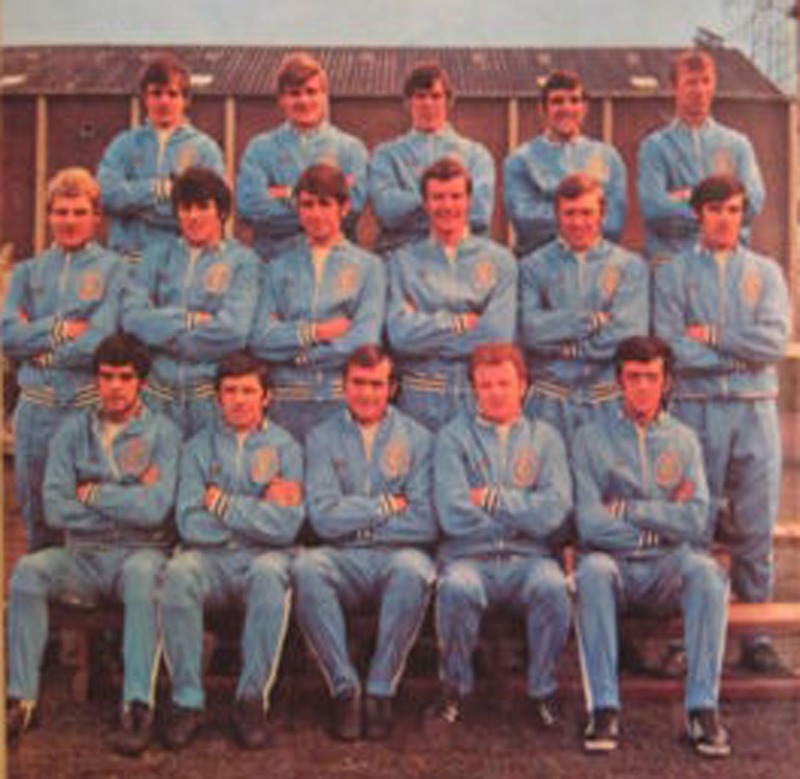 Middle Row: Syd Owen (Coach), Alan Peacock, Ian Lawson, Gary Sprake, Don Revie (Manager), Brian Williamson, Paul Madeley, Barrie Wright, Bob English (Physio). 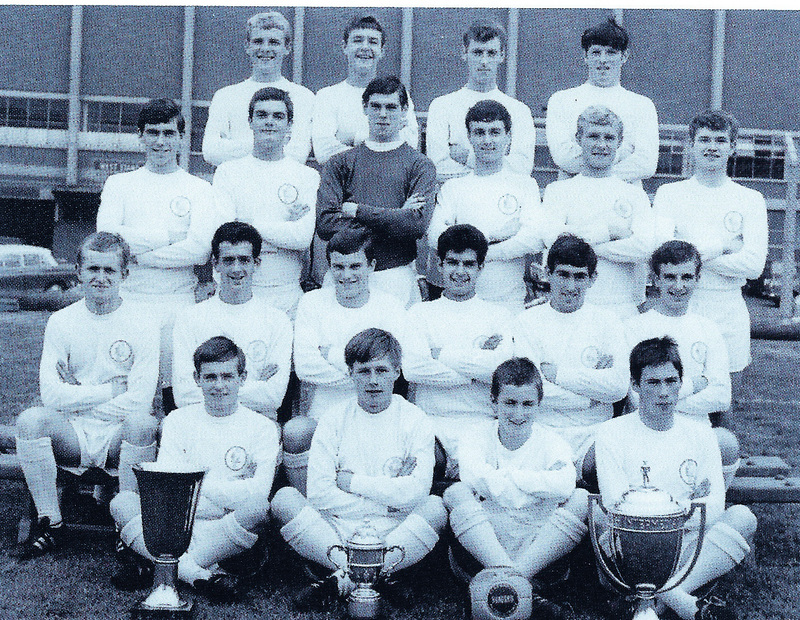 Front Row: Billy Bremner, Johnny Giles, Jim Storrie, Bobby Collins, Tommy Henderson, Don Weston, Rod Johnson. Back Row: Norman Hunter, Jack Charlton, Gary Sprake, Paul Reaney, Willie Bell. 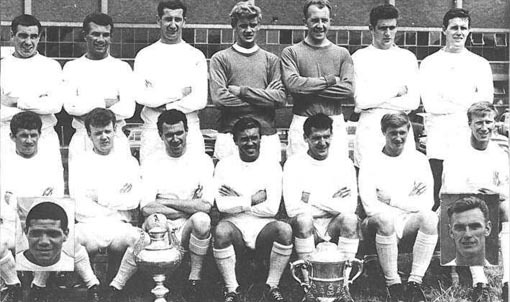 Front Row:Johnny Giles, Jim Storrie, Alan Peacock, Don Revie (Manager), Bobby Collins, Albert Johanneson, Billy Bremner. 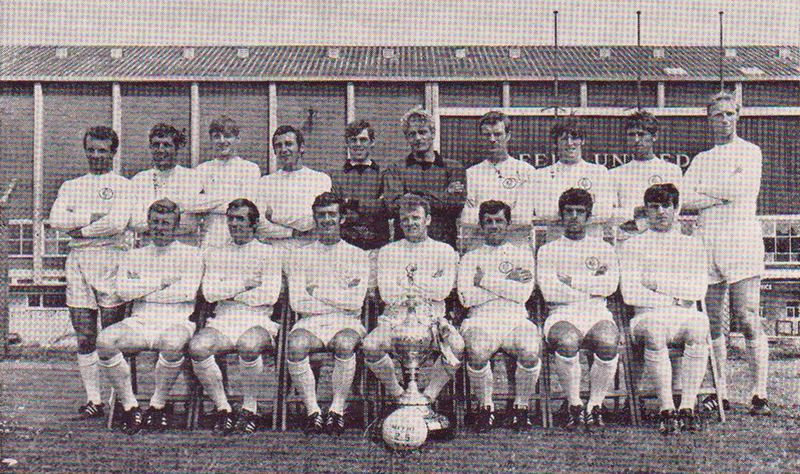 Back Row: Billy Bremner, Paul Madeley, Willie Bell, Gary Sprake, Paul Reaney, Norman Hunter, Jimmy Greenhoff, Don Weston. Front Row: Jim Storrie, Johnny Giles, Terry Cooper, Bobby Collins, Alan Peacock, Jack Charlton, Albert Johanneson, Rod Johnson. 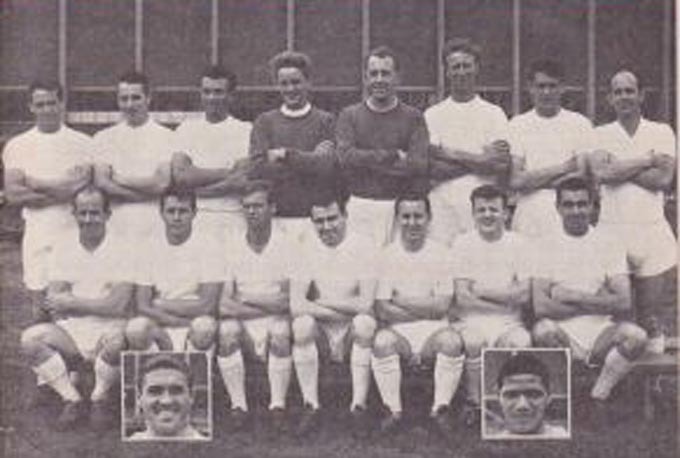 Back Row: Willie Bell, Paul Reaney, Jack Charlton, Gary Sprake, Alan Peacock, Norman Hunter. 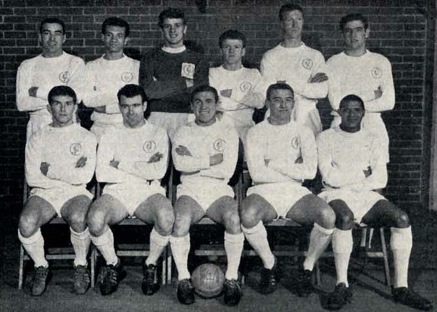 Front Row: Billy Bremner, Johnny Giles, Don Weston, Don Revie (Manager), Bobby Collins, Albert Johanneson, Les Cocker (Trainer). 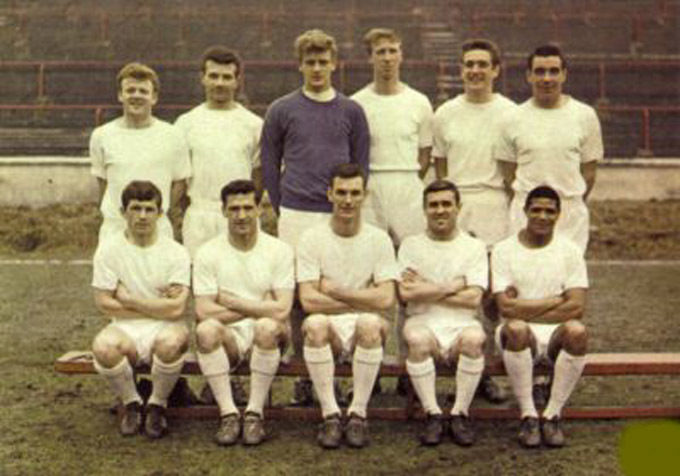 Back Row: Jack Charlton, Jim Storrie, Gary Sprake, Bob Williamson, Norman Hunter, Paul Reaney, Willie Bell. 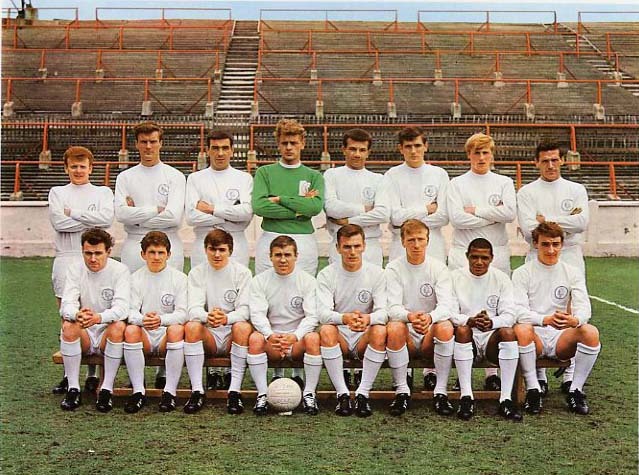 Front Row: Johnny Giles, Alan Peacock, Bobby Collins, Albert Johanneson, Billy Bremner. Inset: Mike O'Grady, Peter Lorimer. 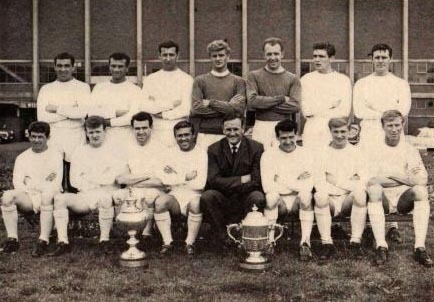 Back Row: Willie Bell, Paul Reaney, Gary Sprake, Billy Bremner, Jack Charlton, Norman Hunter. Front Row: Johnny Giles, Jim Storrie, Bobby Collins, Rod Johnson, Albert Johanneson. 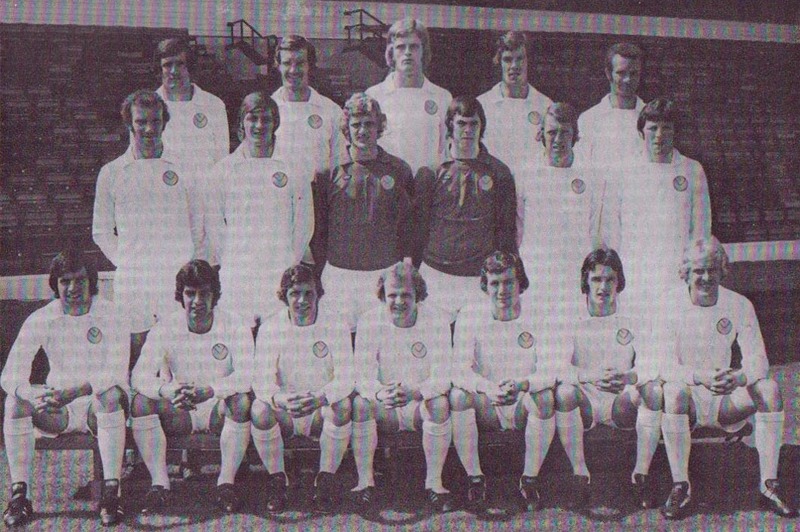 Back Row: Billy Bremner, Paul Reaney, Gary Sprake, Jack Charlton, Norman Hunter, Willie Bell, Jim Storrie. 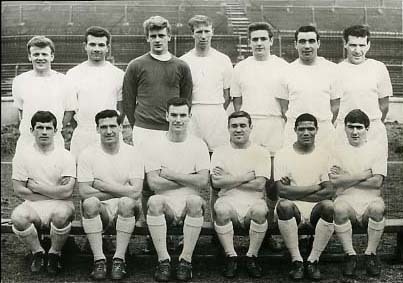 Front Row: Johnny Giles, Don Weston, Alan Peacock, Bobby Collins, Albert Johanneson, Terry Cooper. 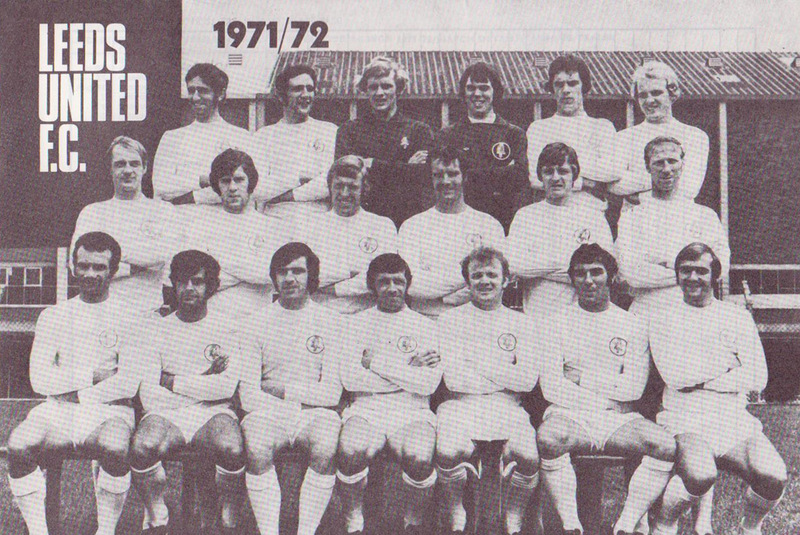 Back Row: Billy Bremner, Willie Bell, Paul Madeley, Gary Sprake, Paul Reaney, Norman Hunter, Jimmy Greenhoff. 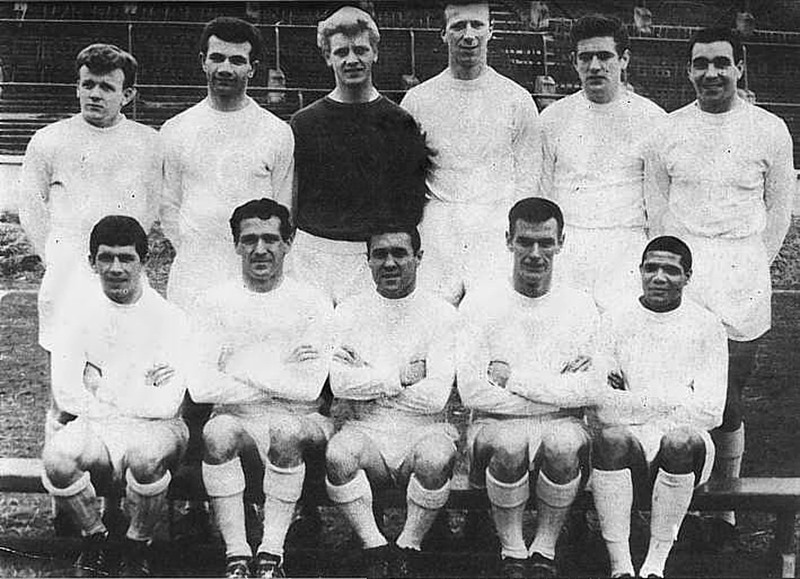 Front Row: Don Weston, Terry Cooper, Johnny Giles, Jim Storrie, Alan Peacock, Bobby Collins, Jack Charlton, Albert Johanneson. Back Row: Graham Smith, Nigel Davey, Barrie Wright, Jimmy Greenhoff, Paul Madeley, Terry Cooper, Derek Ryder. 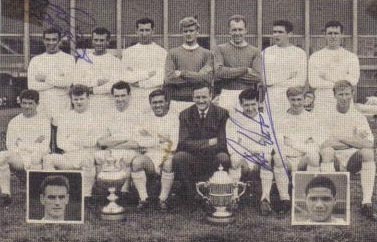 Standing: Freddie Goodwin, Willie Bell, Paul Reaney, Brian Williamson, Gary Sprake, David Harvey, Rod Johnson, Peter Lorimer, Rod Belfitt. 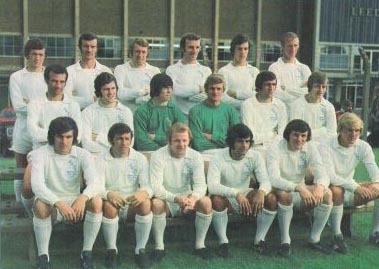 Sitting: John Hawksby, Johnny Giles, Alan Peacock, Norman Hunter, Ian Lawson, Jack Charlton, Jim Storrie, Billy Bremner, Tommy Henderson, Bobby Collins. Front Row: Denis Hawkins, Douglas Mitchell, Geoffrey Scrine, John Lawson, Walter Sweeney, Eddie Gray, Mick Bates, Terry Hibbitt, Bob Sibbald, Jimmy Lumsden, John Price. 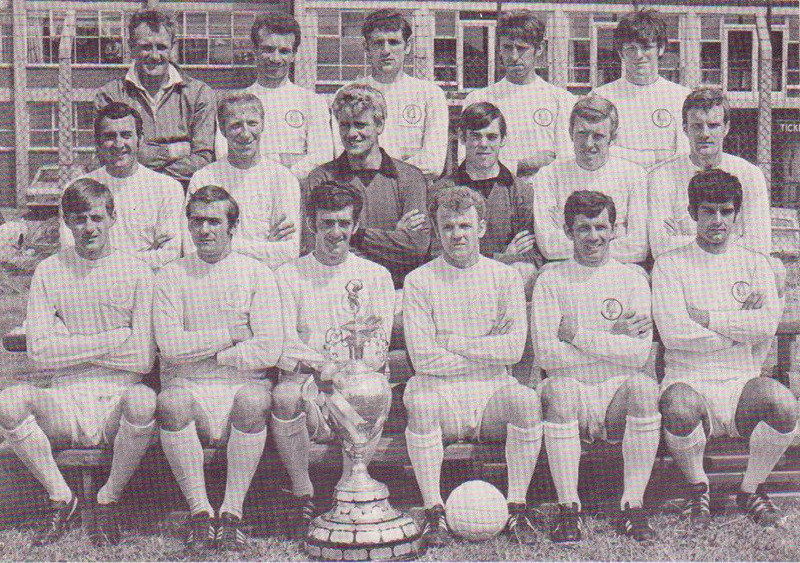 Back Row: Les Cocker (Trainer), Syd Owen (Coach), Billy Bremner, Paul Reaney, Gary Sprake, Alan Peacock, Willie Bell, Norman Hunter, Paul Madeley, Bob English (Physio). Front Row: Jimmy Greenhoff, Albert Johanneson, Johnny Giles, Bobby Collins, Don Weston, Terry Cooper, Jack Charlton, Rod Johnson. Back Row: Jimmy Lumsden, Derek Ryder, David Harvey, John Craggs, Eddie Gray, Walter Sweeney. Front Row: Stephen, Briggs, Dennis Hawkins, Bob Sibbald, Jack Winspear, Mick Bates, Paul Peterson. Back Row: John Price, Jimmy Lumsden, David Harvey, Walter Sweeney, Eddie Gray, Terry Yorath, Cyril Partridge (Trainer). Front Row: Maurice Parkin, Dennis Hawkins, Bob Sibbald, Mick Bates, Terry Hibbitt, Paul Peterson. Back Row: Mick Bates, Jack Winspear, Rod Johnson, Nigel Davey, Barrie Wright, Graham Smith, Paul Reaney, Norman Hunter, Rod Belfitt, John Price. Middle Row: Jimmy Lumsden, Bobby Sibbald, Peter Lorimer, David Harvey, Brian Williamson, Bob Williamson, Gary Sprake, Paul Madeley, Jimmy Greenhoff, Derek Ryder, Terry Cooper. 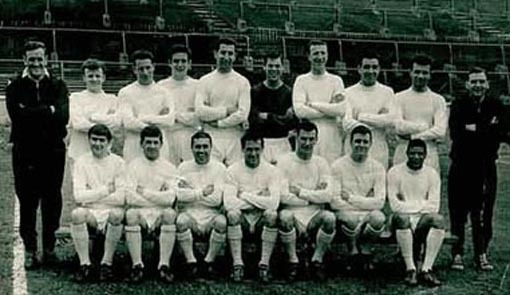 Front Row: Dennis Hawkins, Terry Hibbitt, Willie Bell, Bobby Collins, Paul Peterson, John Lawson, Jim Storrie, Jack Charlton, Alan Peacock, Terry Yorath, Walter Sweeney, Billy Bremner, Johnny Giles, Albert Johanneson. Absent when photograph was taken: Don Weston, Eddie Gray, Maurice Parkin. 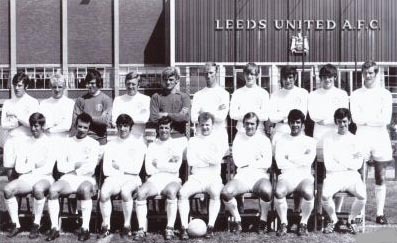 Back Row: Don Revie (Manager), Alan Peacock, Willie Bell, Jack Charlton, Gary Sprake, Paul Madeley, Norman Hunter, Rod Belfitt, Les Cocker (Trainer). 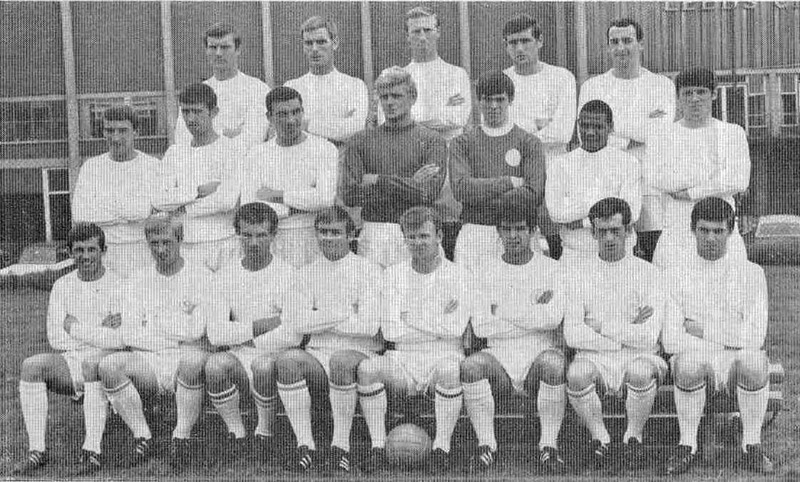 Front Row: Terry Cooper, Paul Reaney, Albert Johanneson, Billy Bremner, Jimmy Greenhoff, Johnny Giles, Peter Lorimer, Eddie Gray. Back Row: Willie Bell, Paul Reaney, Peter Lorimer, Rod Belfitt, Terry Cooper. Middle Row: Bobby Collins, Norman Hunter, Brian Williamson, Gary Sprake, Jimmy Greenhoff, Paul Madeley. 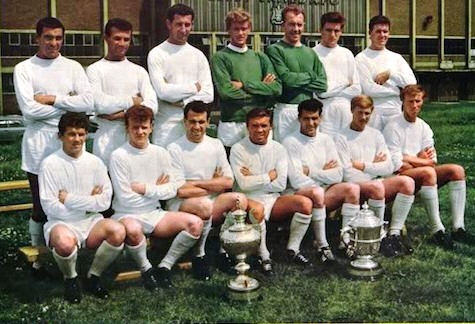 Front Row: Rod Johnson, Jim Storrie, Jack Charlton, Alan Peacock, Billy Bremner, Johnny Giles, Albert Johanneson. Inset: Peter Lorimer, Mike O'Grady. Back Row: Terry Yorath, Jimmy Lumsden, David Harvey, Walter Sweeney, Jim McKay, Mick Bates, Eddie Gray, John Craggs. Front Row: Stephen, Briggs, Dennis Hawkins, Cyril Partridge (Manager), Bob Sibbald, Terry Hibbitt, Paul Peterson. Back Row: Terry Yorath, Maurice Parkin, Stephen, Briggs, Eddie Gray. Third Row: Willie Waddell, John Craggs, David Harvey, Jim McKay, Brian Mundell. 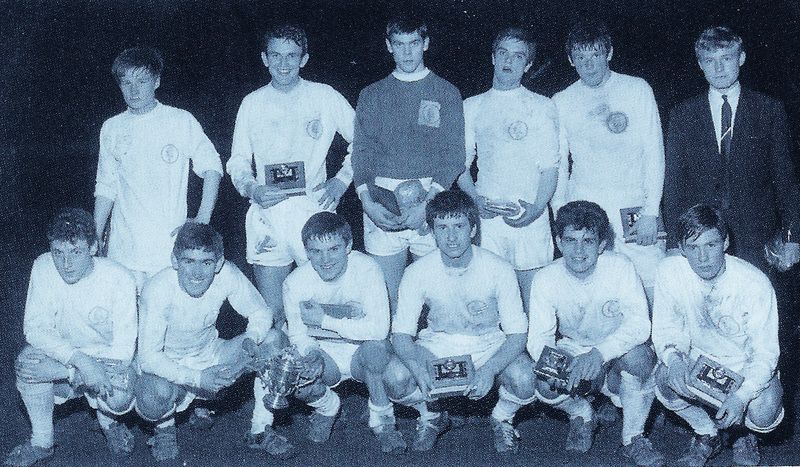 Second Row: Eddie Pegrum, Terry Hibbitt, Bob Sibbald, Mick Bates, Dennis Hawkins, Jon Lawson. Front Row: Derek Montgomery, Jimmy Lumsden, Ian Kerray, Paul Peterson. Top Row: Mick Bates, Bobby Sibbald, Terry Hibbitt, Nigel Davey, Albert Johanneson, Walter Sweeney, Rod Belfitt. 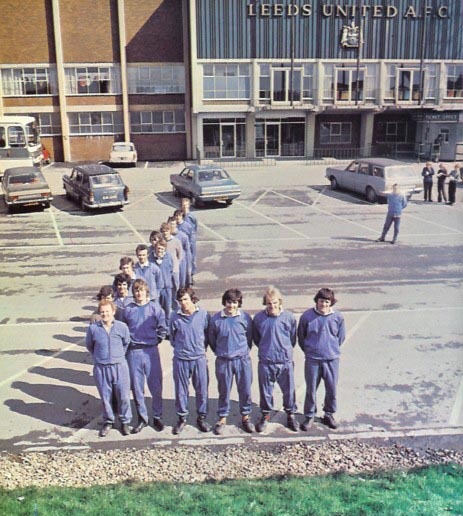 Back Row: Les Cocker (Trainer), Mike O'Grady, Stephen Briggs, Barrie Wright, Jimmy Greenhoff, David Harvey, Derek Edmonds, Gary Sprake, Rod Johnson, Terry Cooper, Jimmy Lumsden, Eddie Gray, Alan Peacock,Paul Madeley, Syd Owen (Coach). Middle Row: Bob English (Physio), Jim McKay, Paul Reaney, Bobby Collins, Johnny Giles, Jack Charlton, Billy Bremner, Jim Storrie, Peter Lorimer, Dennis Hawkins, Willie Bell, Norman Hunter, Cyril Partridge (Reserve Coach/Trainer). Front Row: Brian Mundell, Eddie Pegrum, Jimmy Craggs, W. Walls, Ian Kerray, Maurice Parkin, Paul Peterson, Willie Waddell, Derek Montgomery, John Lawson, Terry Yorath. Back Row: Eddie Pegrum, Terry Yorath, David Harvey, Eddie Gray, Walter Sweeney, Willie Waddell, Cyril Partridge (Coach). Front Row: Paul Peterson, Ian Kerray, Maurice Parkin, Bobby Sibbald, Derek Montgomery, Brian Mundell, John Lawson. 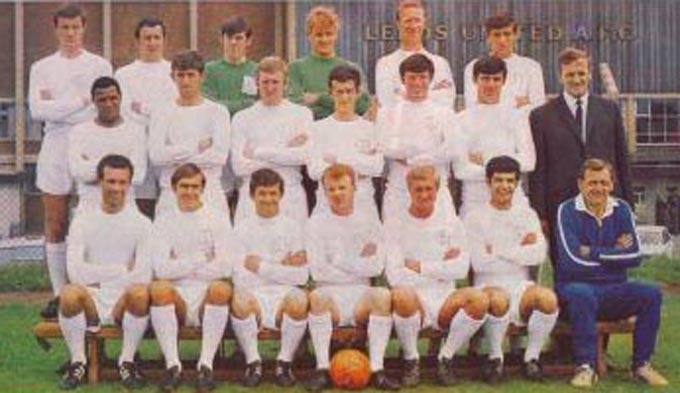 Back Row: Norman Hunter, Alan Peacock, Jack Charlton, Paul Madeley, Eddie Gray, Rod Belfitt. Middle Row: Don Revie (Manager), Willie Bell, Mike O'Grady, David Harvey, Gary Sprake, Albert Johanesson, Rod Johnson, Jimmy Greenhoff. 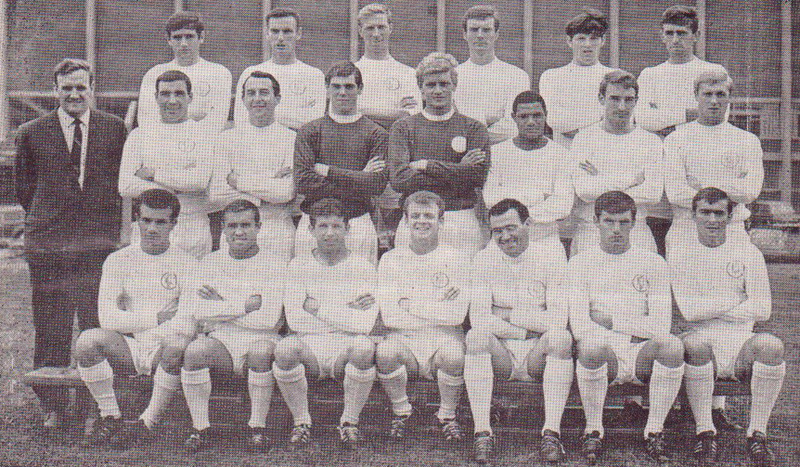 Front Row: Paul Reaney, Bobby Collins, Johnny Giles, Billy Bremner, Jim Storrie, Peter Lorimer, Terry Cooper. 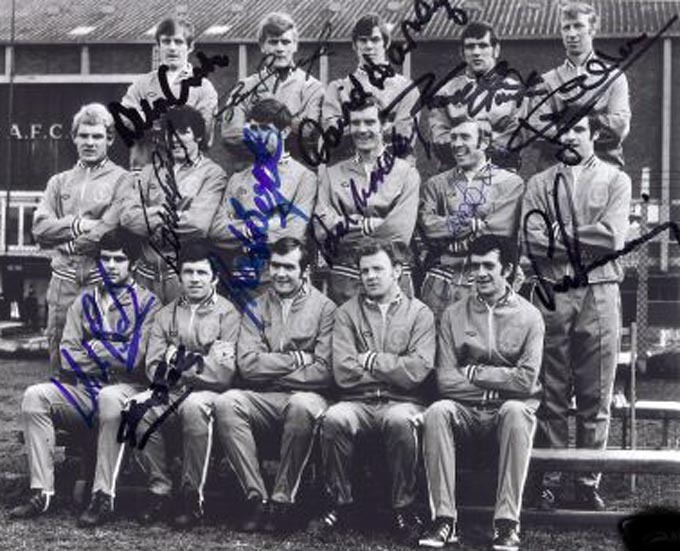 Middle Row: Willie Bell, Mike O'Grady, David Harvey, Gary Sprake, Albert Johanesson, Rod Johnson, Jimmy Greenhoff. 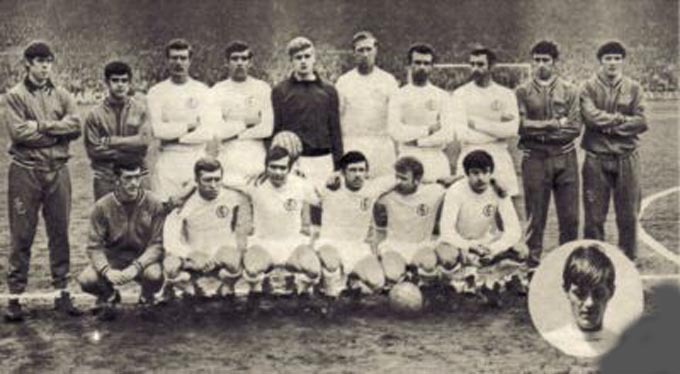 Back Row: Paul Madeley, Alan Peacock, Jack Charlton, Norman Hunter, Mike O'Grady. 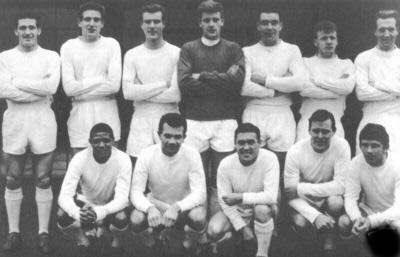 Middle Row: Rod Johnson, Rod Belfitt, Willie Bell, Gary Sprake, David Harvey, Albert Johanneson, Eddie Gray. Front Row: Johnny Giles, Jimmy Greenhoff, Paul Reaney, Terry Cooper, Billy Bremner, Mick Bates, Terry Hibbitt, Peter Lorimer. Back Row: Jack Charlton, Norman Hunter, Gary Sprake, David Harvey, Paul Madeley, Mick Jones. 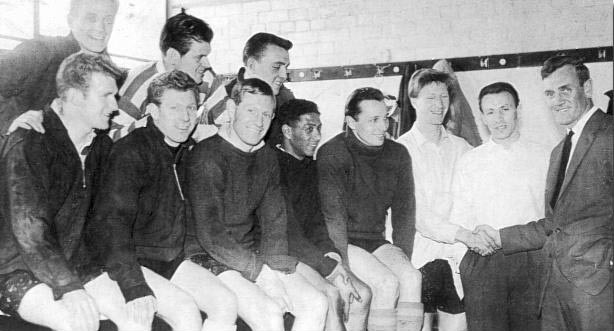 Middle Row: Don Revie (Manager), Paul Reaney, Mike O'Grady, Jimmy Greenhoff, Rod Belfitt, Eddie Gray, Les Cocker (Trainer). 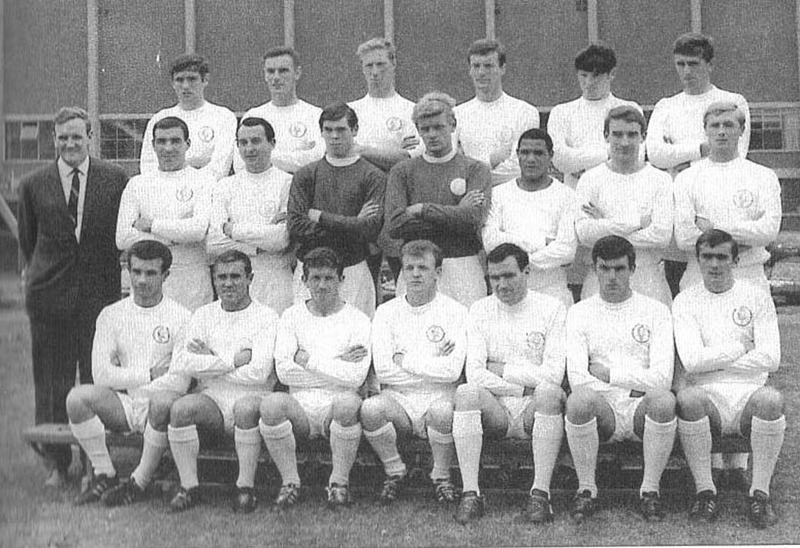 Front Row: Albert Johanneson, Mick Bates, Terry Cooper, Billy Bremner, Peter Lorimer, Johnny Giles,Terry Hibbitt. 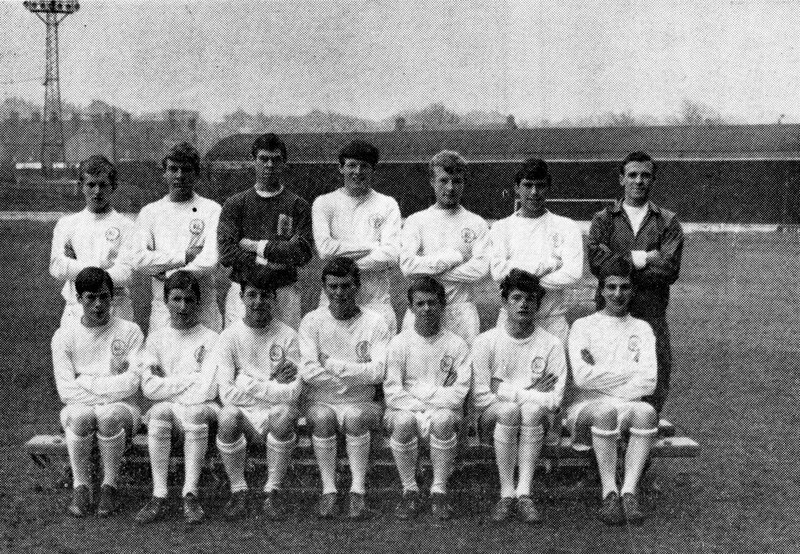 Back Row: Paul Madeley, Paul Reaney, Terry Cooper, Willie Bell, Gary Sprake, David Harvey, Mike O'Grady, Eddie Gray, Jack Charlton, Norman Hunter. Front Row: Rod Belfitt, Jimmy Greenhoff, Mick Bates, Billy Bremner, Johnny Giles, Peter Lorimer, Albert Johanneson, Terry Hibbitt. 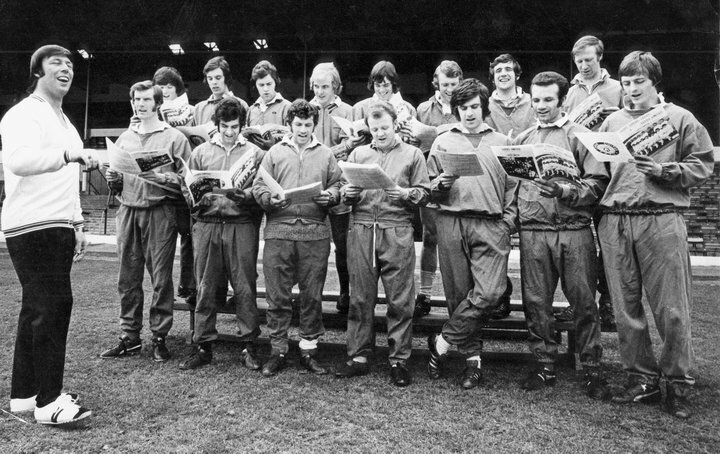 Back Row: Paul Reaney, Norman Hunter, Gary Sprake, David Harvey, Rod Belfitt, Paul Madeley, Willie Bell. 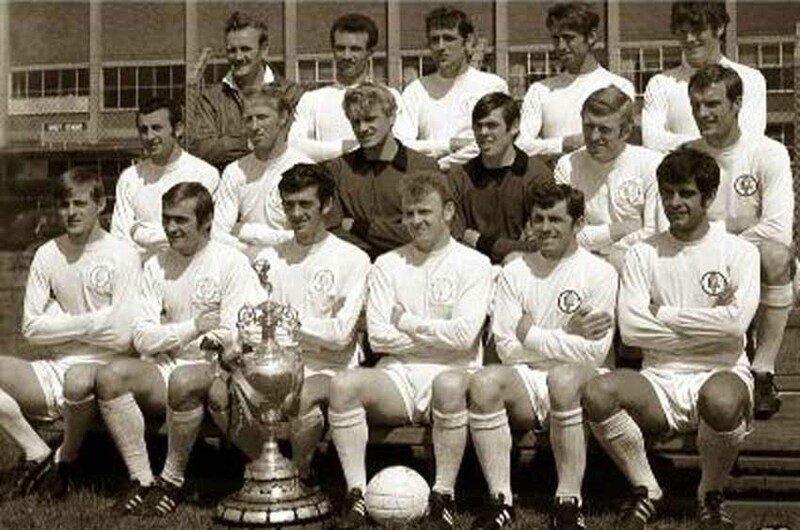 Front Row: Johnny Giles, Terry Cooper, Mick Bates, Billy Bremner, Jimmy Greenhoff, Eddie Gray, Peter Lorimer. Inset: Mick Jones, Jack Charlton. Back Row: Norman Hunter, Mick Jones, Paul Madeley, David Harvey, Gary Sprake, Jack Charlton, Rod Belfitt, Eddie Gray, Mike O'Grady. Front Row: Paul Reaney, Terry Cooper, Jimmy Greenhoff, Johnny Giles, Billy Bremner, Mick Bates, Terry Hibbitt, Peter Lorimer, Albert Johanneson. 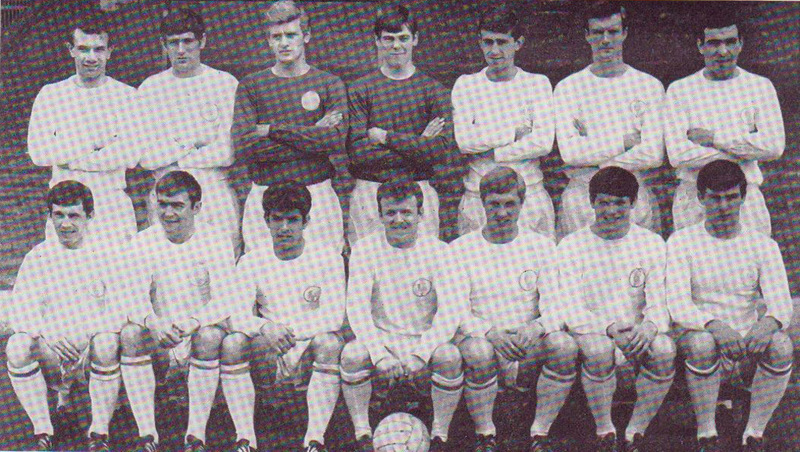 Back Row: Gary Sprake, Peter Lorimer, Eddie Gray, Jack Charlton, Paul Madeley, Rod Belfitt. 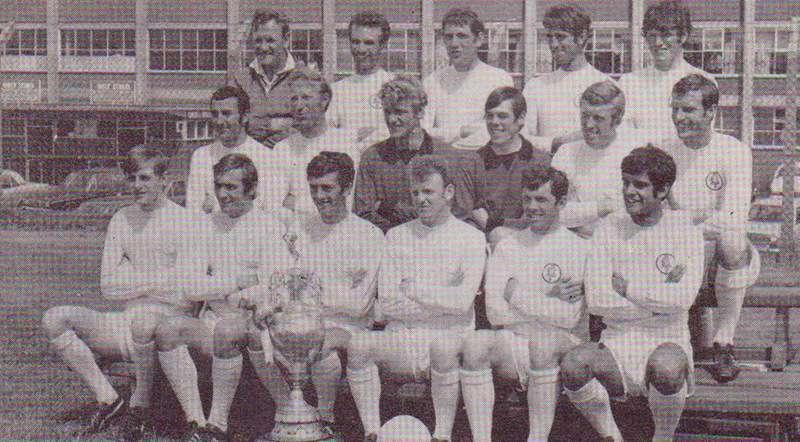 Front Row: Jimmy Greenhoff, Terry Cooper, Paul Reaney, Norman Hunter, Johnny Giles, Billy Bremner. Paul Madeley, Johnny Giles, Terry Cooper, Norman Hunter, Paul Reaney, Gary Sprake, Peter Lorimer, Eddie Gray, Jimmy Greenhoff, Billy Bremner, Jack Charlton. 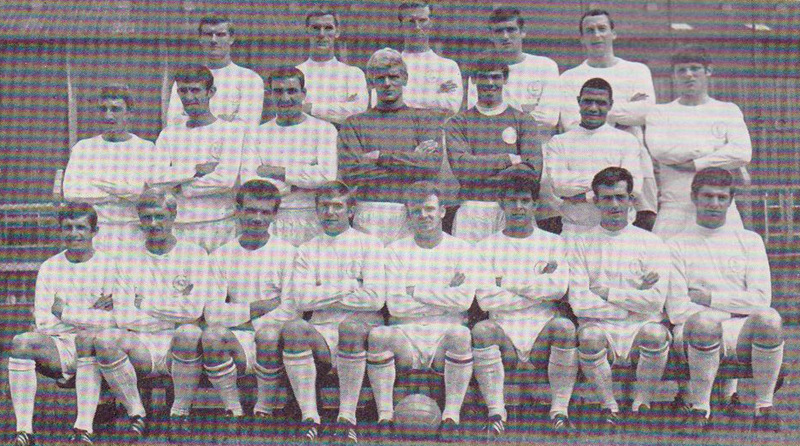 Back Row: Norman Hunter, Mick Bates, Paul Madeley, Gary Sprake, Jack Charlton, Mike O'Grady. 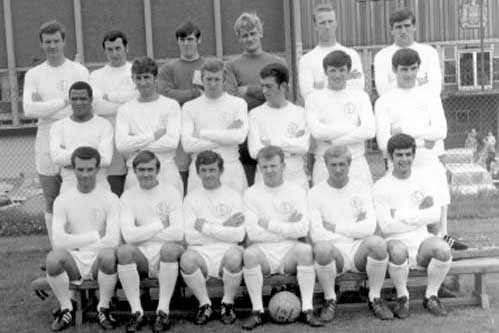 Front Row: Terry Cooper, Billy Bremner, Paul Reaney, Mick Jones, Peter Lorimer. 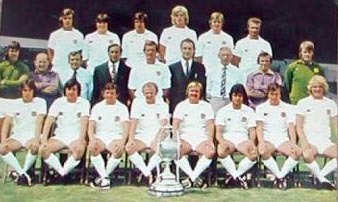 Back Row: Don Revie (Manager), Les Cocker (Trainer), Jack Charlton, Mick Bates, Terry Yorath, Paul Reaney, Terry Hibbitt, David Harvey, Terry Cooper, Rod Belfitt. 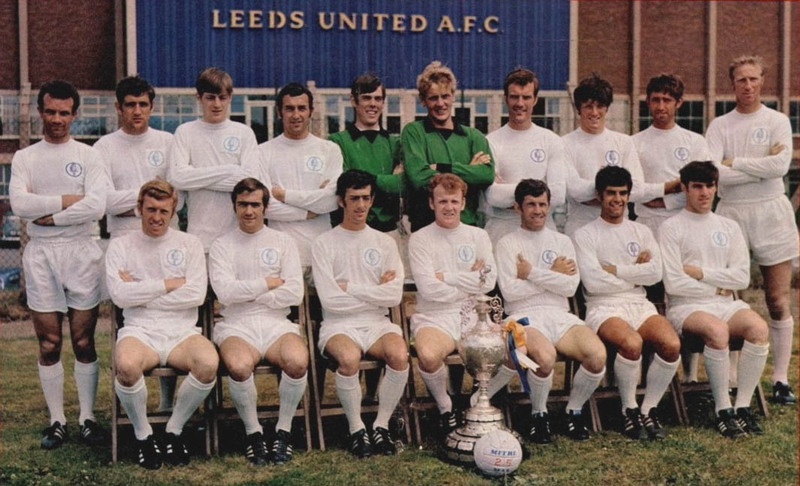 Front Row: Peter Lorimer, Paul Madeley, Gary Sprake, Billy Bremner, Mick Jones, Norman Hunter, Mike O'Grady. 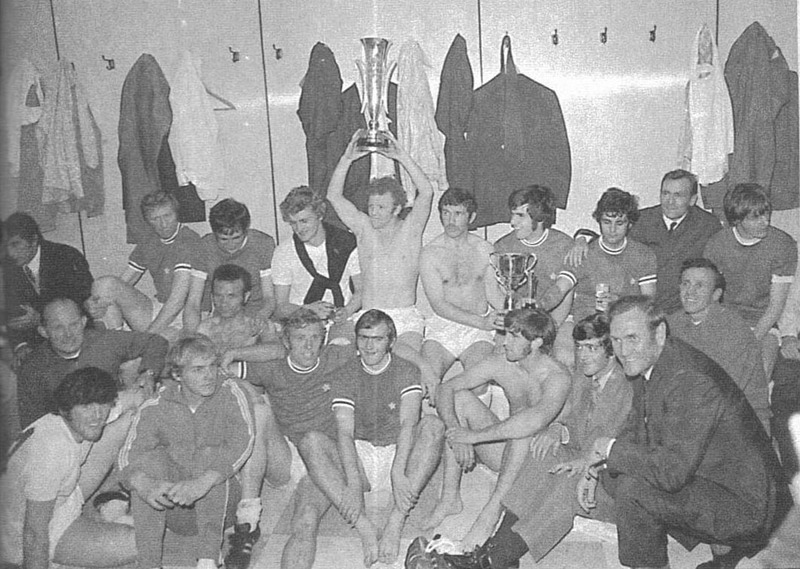 Terry Hibbitt, Gary Sprake, Peter Lorimer and Billy Bremner display the Inter-Cities Fairs Cup won on 11-9-68 at Ferencvaros. 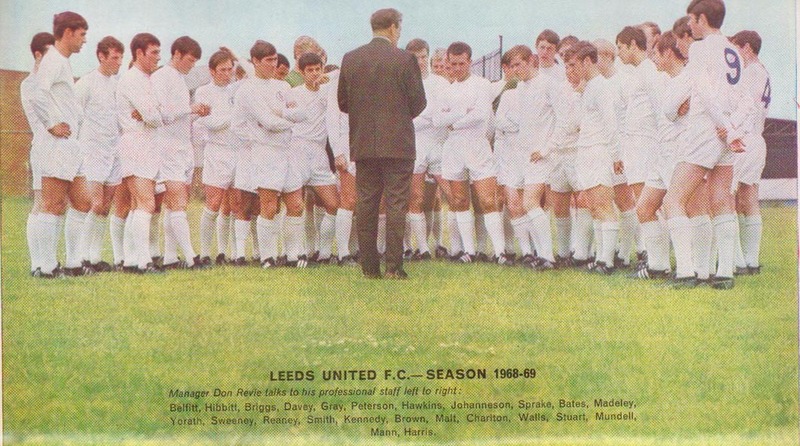 Manager Don Revie addresses all his playing staff before the 1968-69 pre-season training. 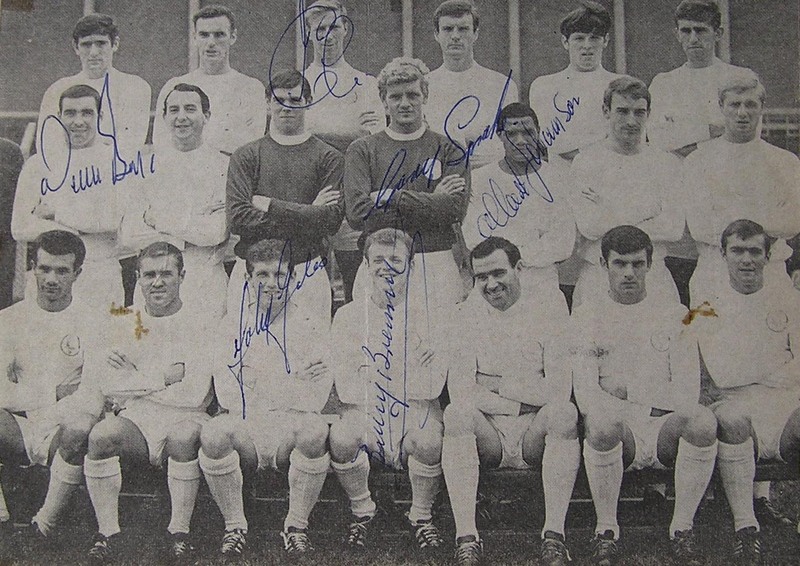 Back Row: Paul Madeley, Mike O'Grady, David Harvey, Gary Sprake, Jack Charlton, Norman Hunter. Middle Row: Albert Johanneson, Rod Belfitt, Mick Jones, Terry Hibbitt, Eddie Gray, Peter Lorimer. 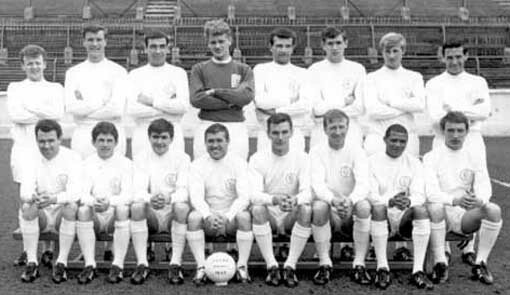 Front Row: Paul Reaney, Terry Cooper, Johnny Giles, Billy Bremner, Jimmy Greenhoff, Mick Bates. 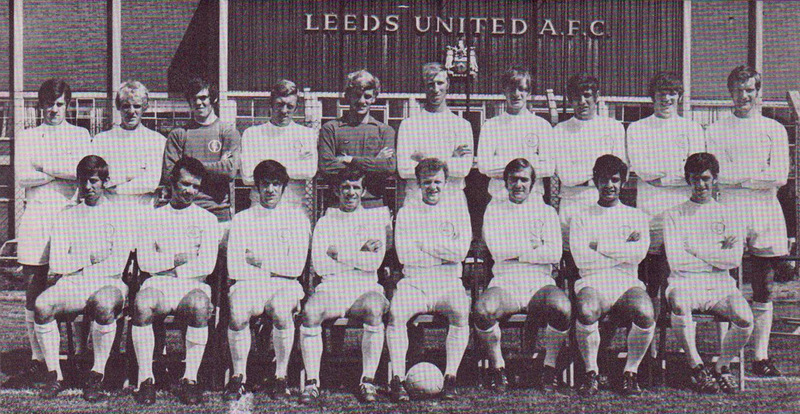 Middle Row: Albert Johanneson, Rod Belfitt, Mick Jones, Terry Hibbitt, Eddie Gray, Peter Lorimer, Don Revie (Manager). 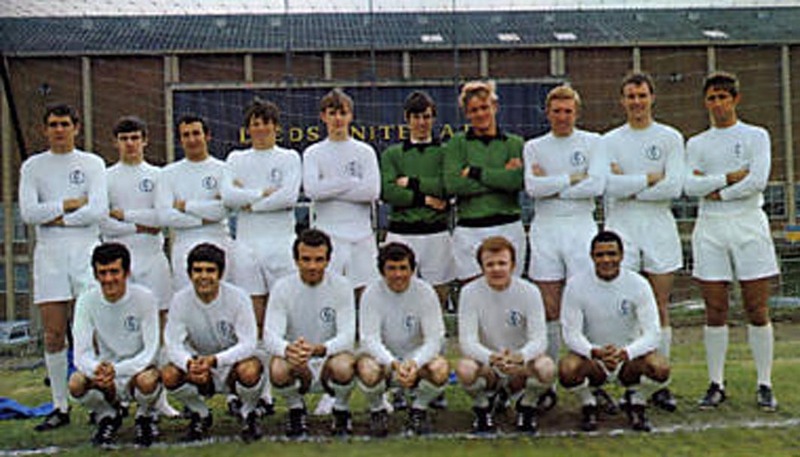 Front Row: Paul Reaney, Terry Cooper, Johnny Giles, Billy Bremner, Jimmy Greenhoff, Mick Bates, Les Cocker (Trainer). 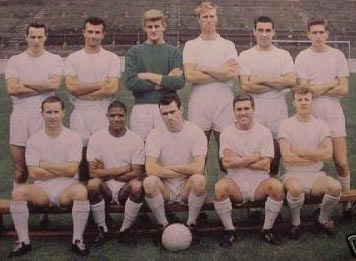 Middle Row: Albert Johanneson, Rod Belfitt, Mick Jones, Terry Hibbitt, Eddie Gray, Peter Lorimer, Les Cocker (Trainer). 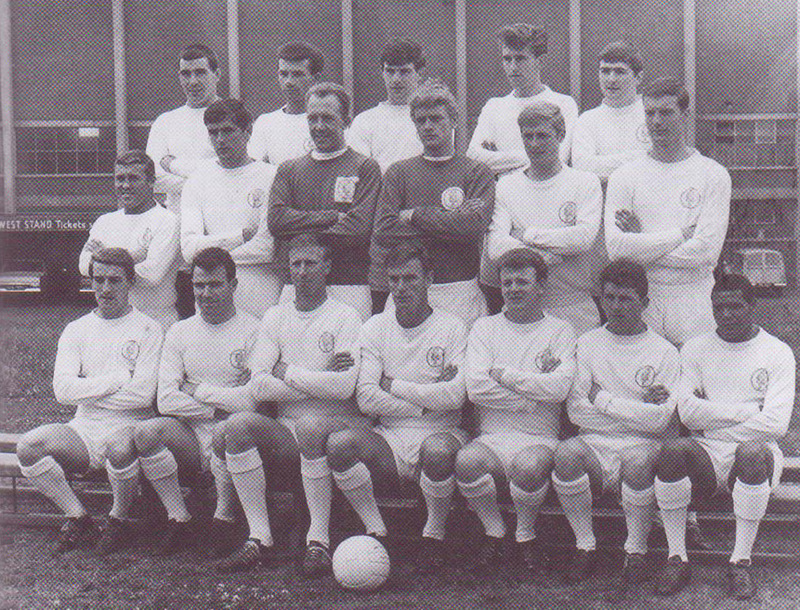 Front Row: Paul Reaney, Terry Cooper, Johnny Giles, Billy Bremner, Jimmy Greenhoff, Mick Bates, . 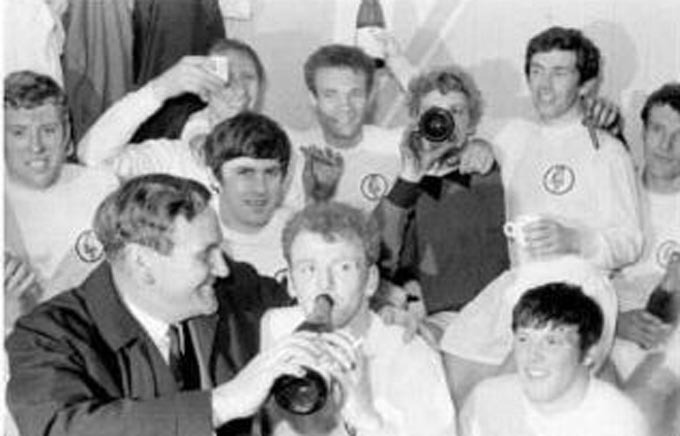 Manager Don Revie holds the champagne bottle for Billy Bremner, as Mick Jones, Jack Charlton, Paul Reaney, Gary Sprake, Johnny Giles, Paul Madeley, Peter Lorimer and Eddie Gray, help to celebrate in the Liverpool dressing rooms after the League Championship Trophy was won in April 1969. 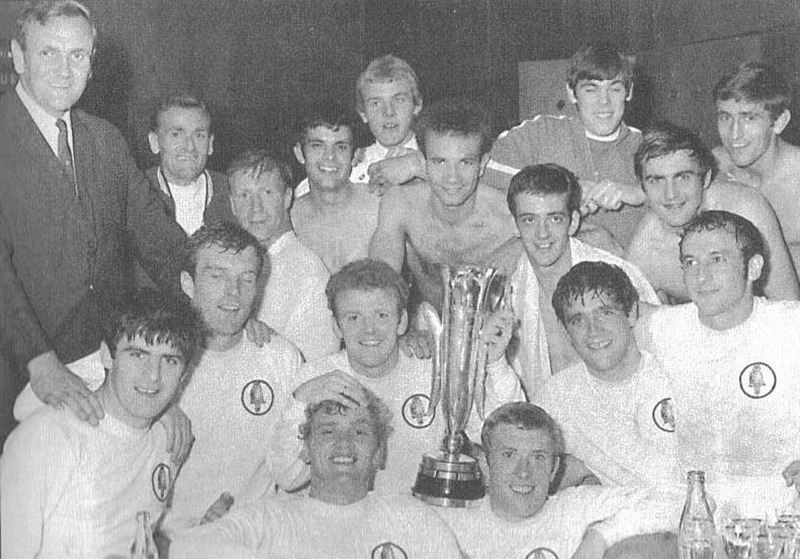 Mick Bates, Rod Belfitt, Eddie Gray, Johnny Giles, Manager Don Revie, Trainer Les Cocker, Billy Bremner and Jack Charlton, with Paul Madeley, Mick Jones, Terry Hibbitt and Terry Cooper kneeling,celebrate with the League Championship Trophy won in April 1969. 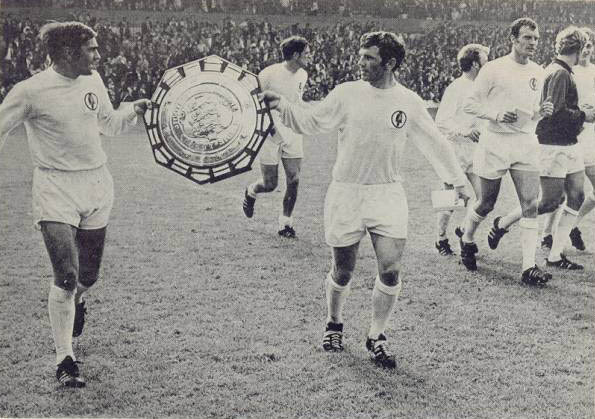 Billy Bremner and Gary Sprake display the League Championship Trophy won in April 1969. Back Row: Mick Bates, Paul Madeley, Norman Hunter, David Harvey, Gary Sprake, Jack Charlton, Paul Reaney, Mike O'Grady, Rod Belfitt, Eddie Gray. Front Row: Terry Hibbitt, Mick Jones, Terry Cooper, Johnny Giles, Billy Bremner, Peter Lorimer. Back Row: David Harvey, Mick Bates, Paul Madeley, Norman Hunter, Gary Sprake, Jack Charlton, Paul Reaney, Mike O'Grady, Rod Belfitt, Eddie Gray. Back Row: Paul Reaney, Jack Charlton, Paul Madeley, Mick Jones, David Harvey, Gary Sprake, Rod Belfitt, Eddie Gray, Norman Hunter. Front Row: Terry Hibbitt, Johnny Giles, Terry Cooper, Billy Bremner, Mike O'Grady, Mick Bates, Peter Lorimer, Albert Johanneson. 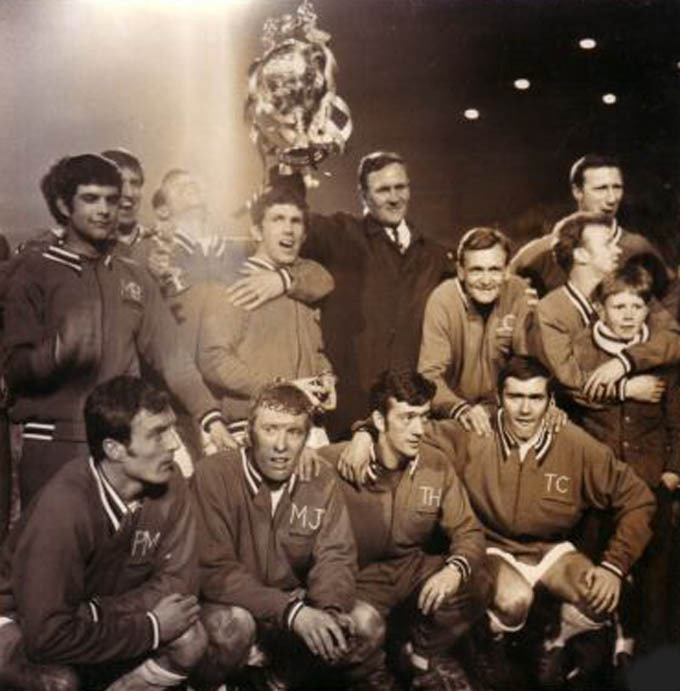 Back Row: Don Revie (Manager), Paul Reaney, Norman Hunter, Rod Belfitt, Eddie Gray. 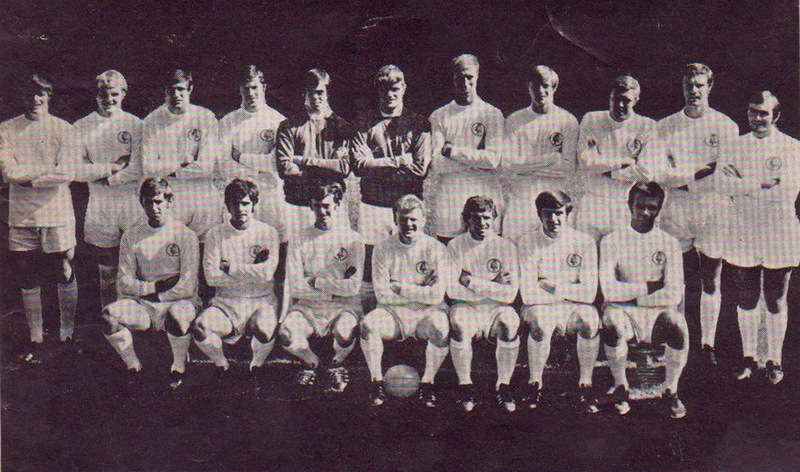 Middle Row: Mike O'Grady, Jack Charlton, Gary Sprake, David Harvey, Mick Jones, Paul Madeley. 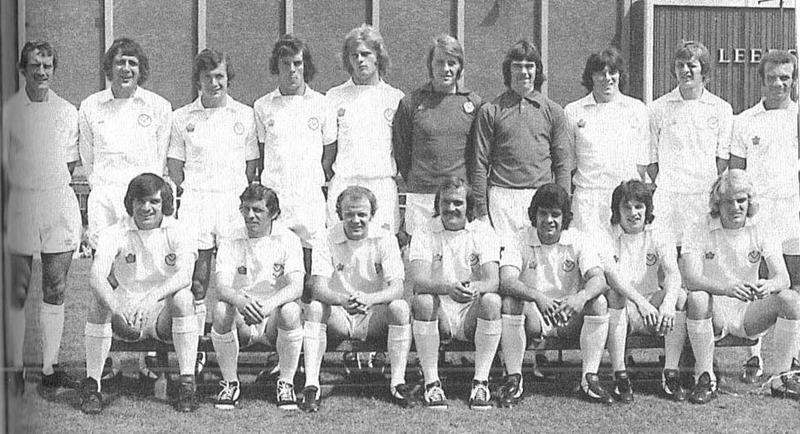 Front Row: Allan Clarke, Terry Cooper, Terry Hibbitt, Billy Bremner, Johnny Giles, Mick Bates. 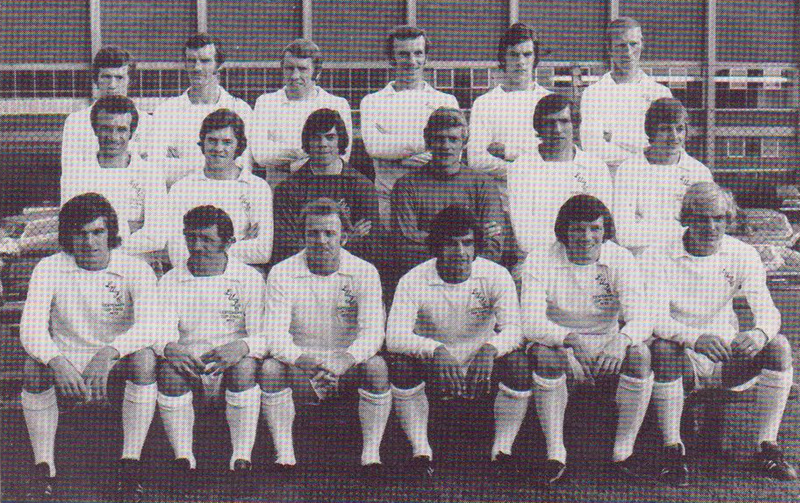 Back Row: Paul Reaney, Norman Hunter, Allan Clarke, Mike O'Grady, David Harvey, Gary Sprake, Paul Madeley, Eddie Gray, Rod Belfitt, Jack Charlton. 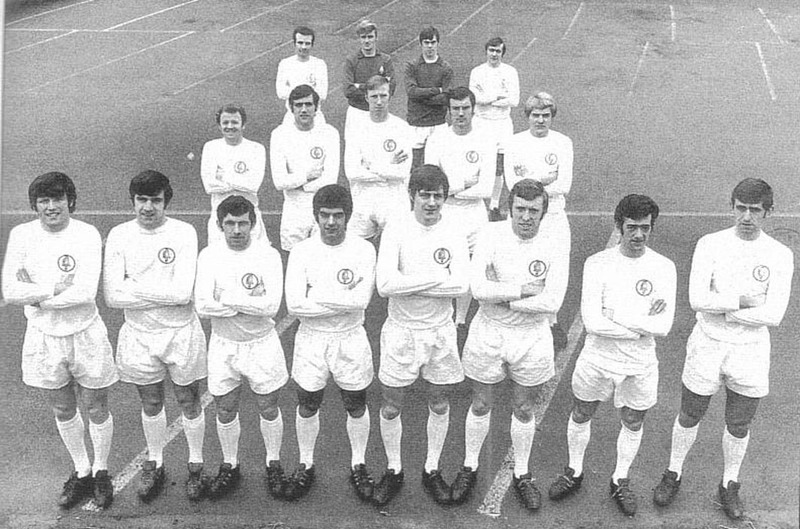 Front Row: Mick Jones, Terry Cooper, Terry Hibbitt, Billy Bremner, Johnny Giles, Mick Bates, Peter Lorimer. 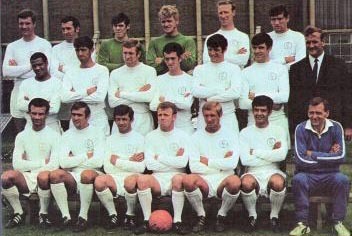 Peter Lorimer (Sub), Jack Charlton, Allan Clarke, Mick Jones, Eddie Gray, Paul Madeley, Terry Cooper, Norman Hunter, Johnny Giles, Paul Reaney, Gary Sprake, Billy Bremner. 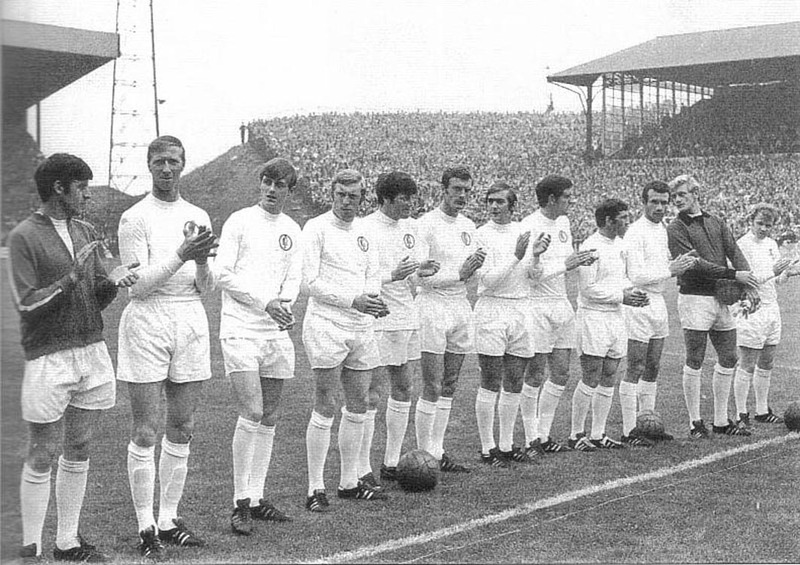 Don Revie applauded by Peter Lorimer (Sub), Jack Charlton, Allan Clarke, Mick Jones, Eddie Gray, Paul Madeley, Terry Cooper, Norman Hunter, Johnny Giles, Paul Reaney, Gary Sprake, Billy Bremner. 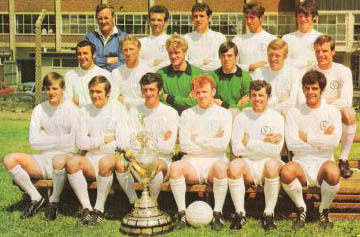 Terry Cooper, Norman Hunter, Johnny Giles, Billy Bremner, Paul Madeley, Gary Sprake, Allan Clarke. 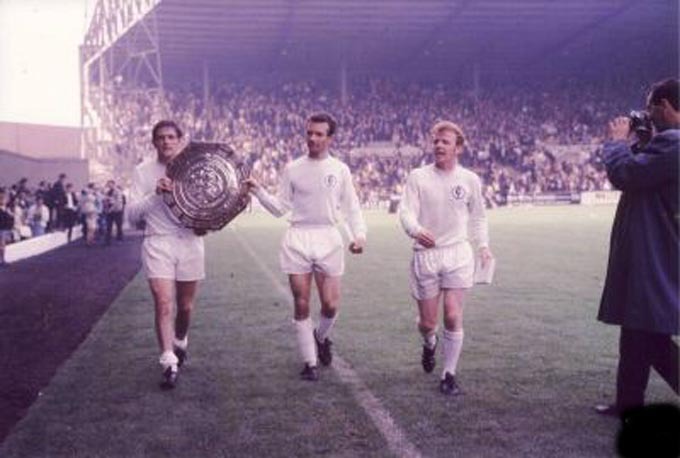 Norman Hunter, Paul Reaney and Billy Bremner parade the Shield. 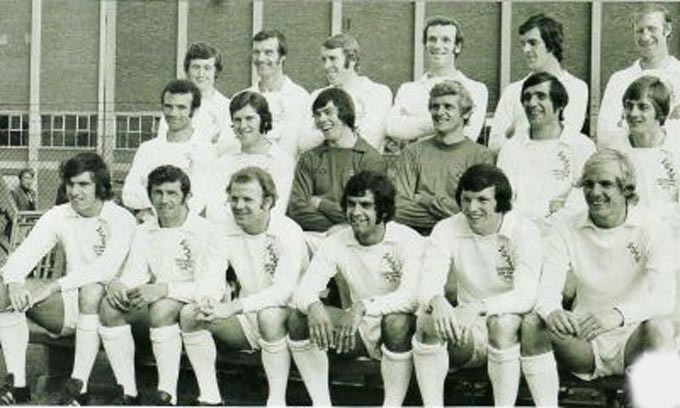 Back Row: Norman Hunter, Peter Lorimer, Mike O'Grady, Eddie Gray, Allan Clarke, David Harvey, Gary Sprake, Mick Jones, Paul Madeley, Rod Belfitt. 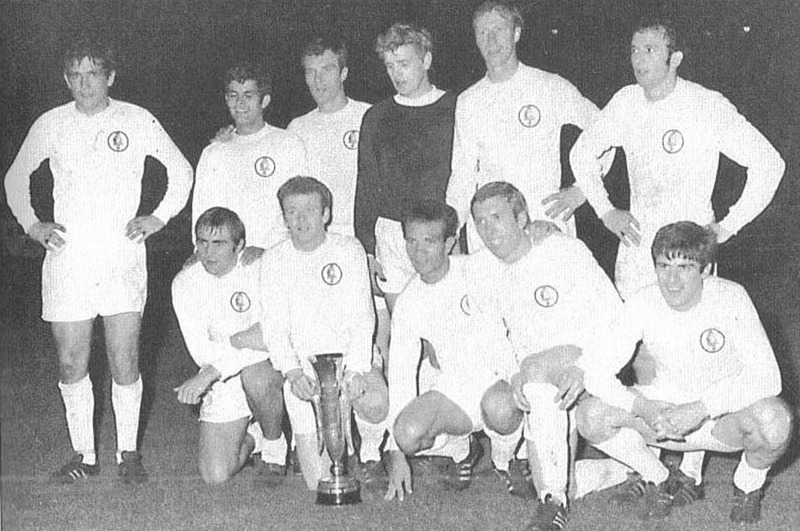 Front Row: Terry Hibbitt, Mick Bates, Paul Reaney, Johnny Giles, Billy Bremner, Albert Johanesson. Back Row: Paul Reaney, Gary Sprake, David Harvey, Terry Cooper. 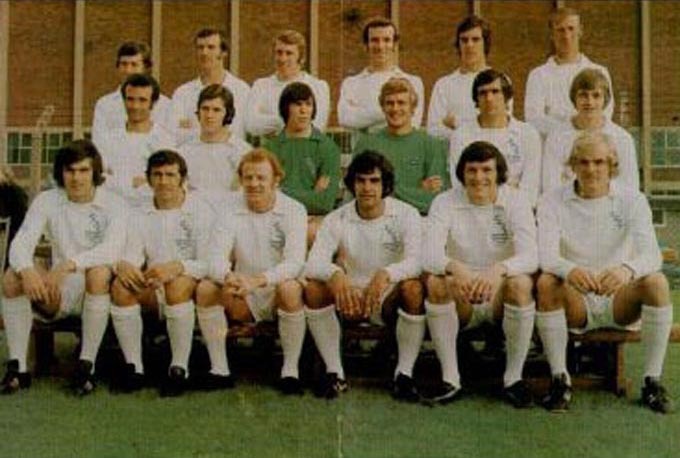 Middle Row: Billy Bremner, Norman Hunter, Jack Charlton, Paul Madeley, Terry Yorath. 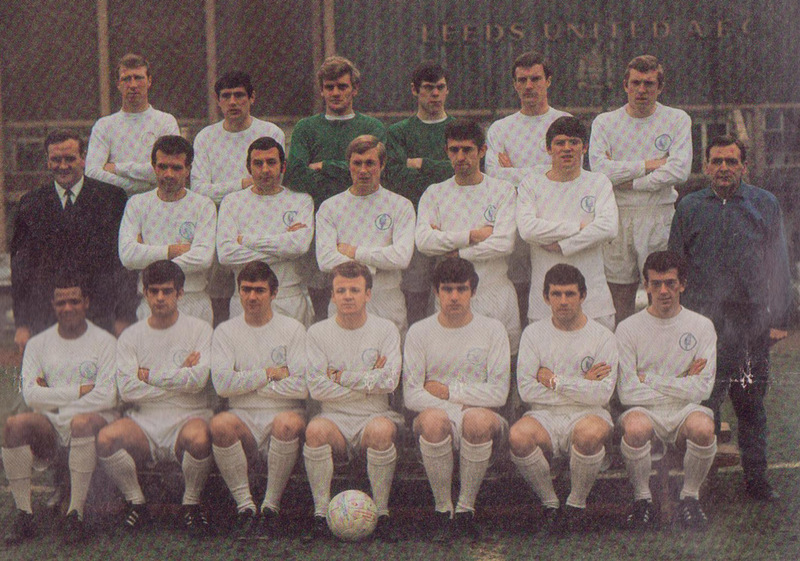 Front Row: Eddie Gray, Peter Lorimer, Johnny Giles, Mick Bates, Allan Clarke, Mick Jones, Terry Hibbitt, Rod Belfitt. Back Row: Jack Charlton, Norman Hunter, David Harvey, Gary Sprake, Allan Clarke. Middle Row: Peter Lorimer, Mick Jones, Paul Madeley, Rod Belfitt, Eddie Gray, Terry Yorath. 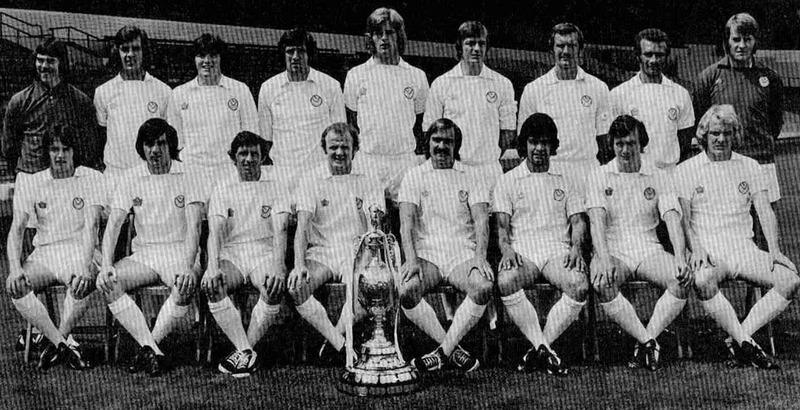 Front Row: Terry Hibbitt, Billy Bremner, Terry Cooper, Johnny Giles,Mick Bates. 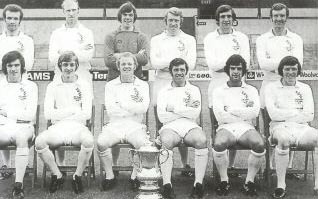 Back Row: Allan Clarke, Gary Sprake, David Harvey, Norman Hunter, Jack Charlton. 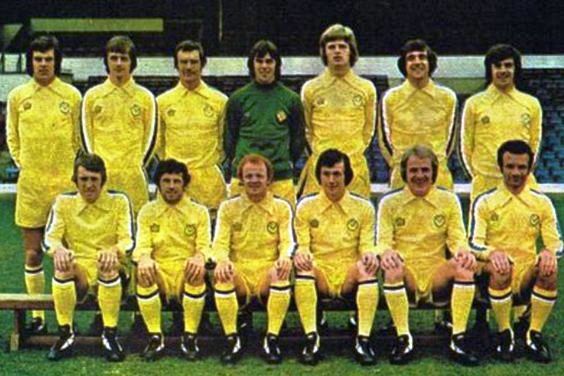 Middle Row: Terry Yorath, Eddie Gray, Rod Belfitt, Paul Madeley, Mick Jones, Peter Lorimer. 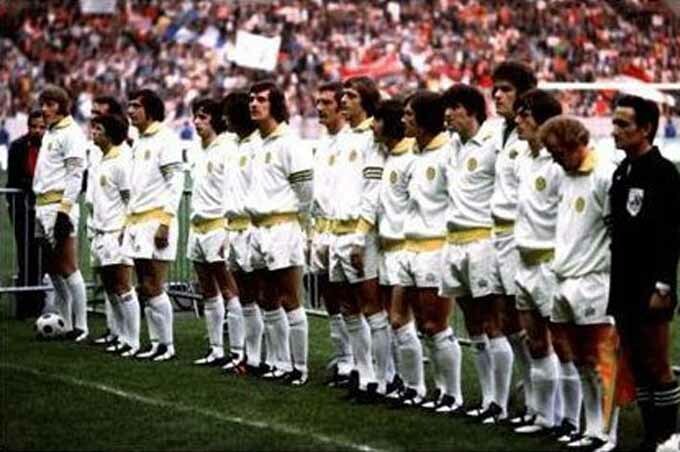 Front Row: Mick Bates, Johnny Giles, Terry Cooper, Billy Bremner, Terry Hibbitt. Back Row: Chris Galvin, Stephen Brown, John Shaw, Terry Yorath, Robert Malt. Middle Row: Andrew Danskin, Brian P. Mundell, M. Keith Edwards, Peter Hearnshaw, Sean O'Neill. Front Row: David Kennedy, Sean Grace, Jimmy Mann, Bobby Rutherford, Brian Stuart, Gary Liddell, David Walls. Back Row: Keith M. Edwards, James John O'Neill, Chris Galvin, David Kennedy, Norman Hunter, Rod Belfitt, Eddie Gray, Terry Yorath, Brian P. Mundell, Maurice Lindley (Assistant-Manager). 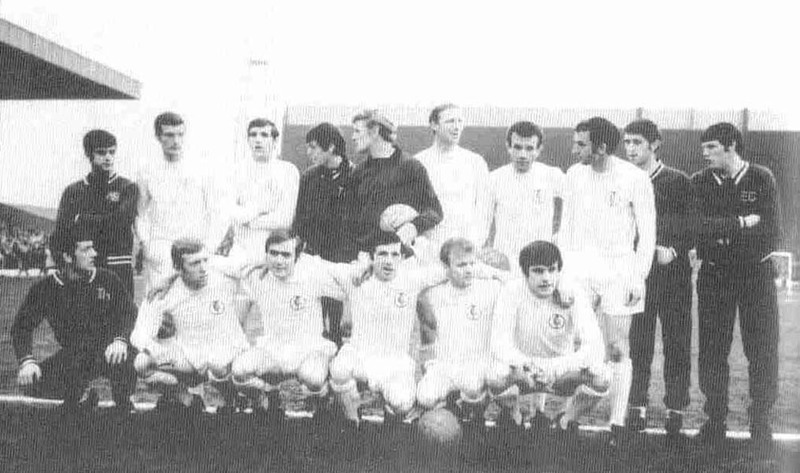 Standing: Don Revie (Manager), Bob English (Physio), Allan Clarke, Mike O'Grady, Jack Charlton, Gary Sprake, David Harvey, Mick Jones, Paul Madeley, Albert Johanneson, Cyril Partridge (Reserves Trainer), Syd Owen (Chief Coach). 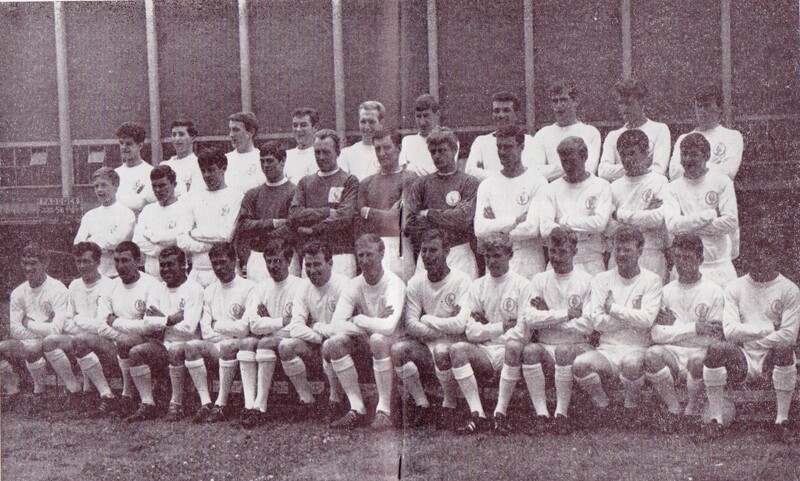 Seated: Les Cocker (Trainer), David Walls, Paul Reaney, Nigel Davey, Terry Cooper, Terry Hibbitt, Johnny Giles, Billy Bremner, Mick Bates, Jimmy Lumsden, Paul Peterson, Derek Edmunds. Front Row: Colin Smith, Robert Malt, Andrew J. Danskin, Stephen Brown, Sean Grace, Jimmy Mann, Bobby Rutherford, Brian Stuart, Philip Thrussell, Peter Hearnshaw. Back Row: Thomas Brannigan, David Kennedy, John Faulkner, John Taylor, John Shaw, James John O'Neill, Keith M. Edwards, Jimmy Mann, Robert Rutherford. 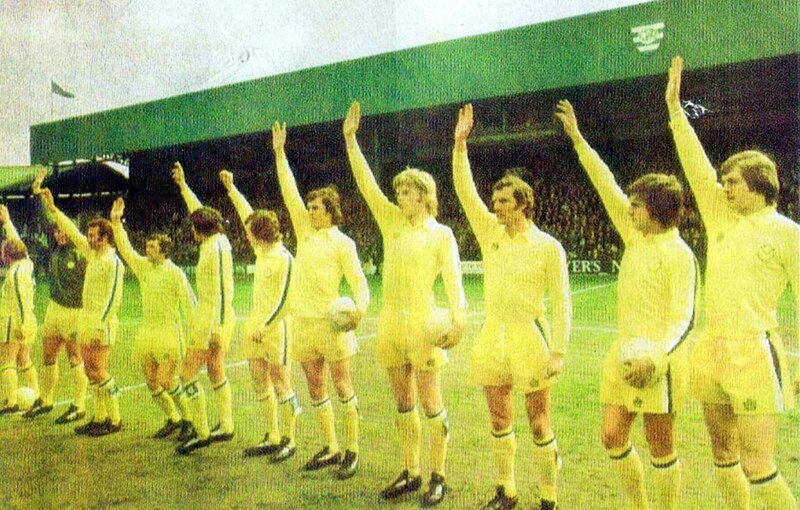 Standing: Frank Gray, Chris Galvin, Terry Yorath, David Harvey, Mick Jones, Gary Sprake, Jack Charlton, Allan Clarke, Norman Hunter, Eddie Gray, Paul Madeley. 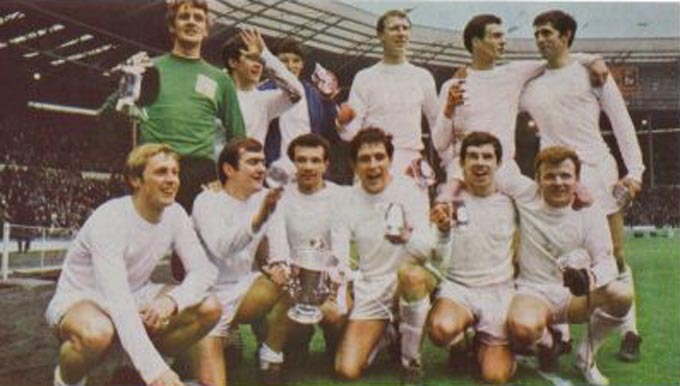 Seated: Rod Belfitt, Paul Reaney, Peter Lorimer, Johnny Giles, Billy Bremner, Terry Cooper, Mick Bates, Terry Hibbitt. 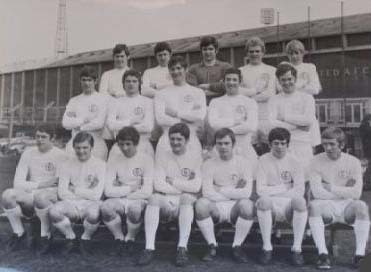 Front Row: Jimmy Lumsden, Ronald Cockin, David Walls, Peter Hampton, Gordon Cattrell, Paul Peterson, Brian Stuart, Gary Liddell, Sean Grace, Billy McGinley. 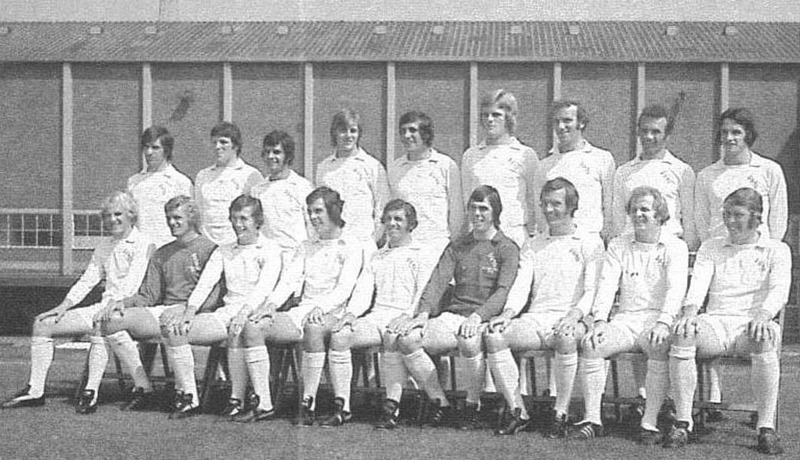 Back Row: Chris Galvin, Terry Yorath, David Harvey, Mick Jones, Gary Sprake, Jack Charlton, Allan Clarke, Norman Hunter, Eddie Gray, Paul Madeley. 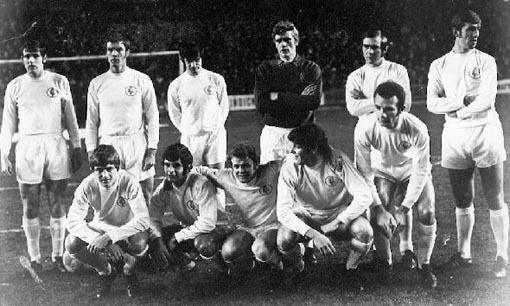 Front Row: Rod Belfitt, Paul Reaney, Peter Lorimer, Johnny Giles, Billy Bremner, Terry Cooper, Mick Bates, Terry Hibbitt. Back Row: Norman Hunter, Paul Madeley, Peter Lorimer, Gary Sprake, Terry Cooper, Rod Belfitt. 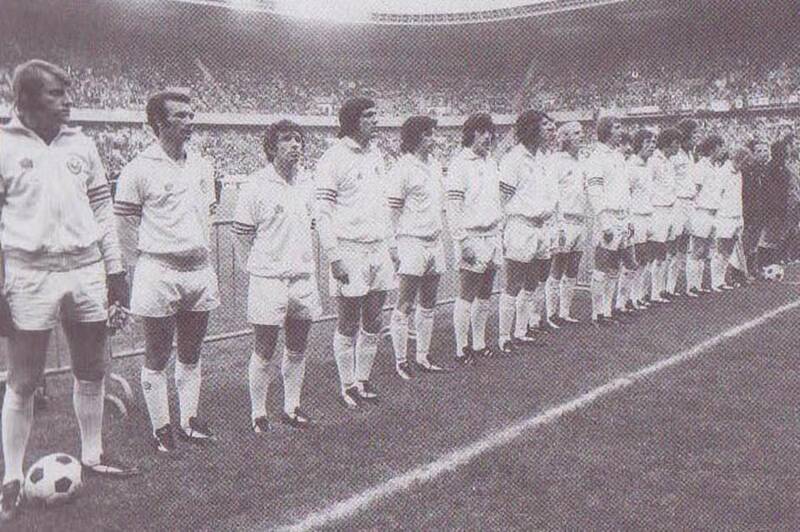 Front Row: Allan Clarke, Mick Bates, Billy Bremner, Eddie Gray, Paul Reaney. 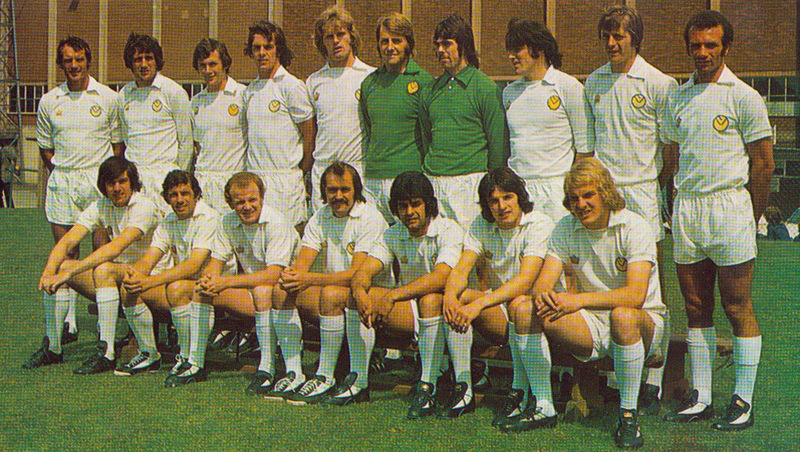 Middle Row: Terry Yorath,Eddie Gray, Rod Belfitt,Paul Madeley, Mick Jones, Peter Lorimer. 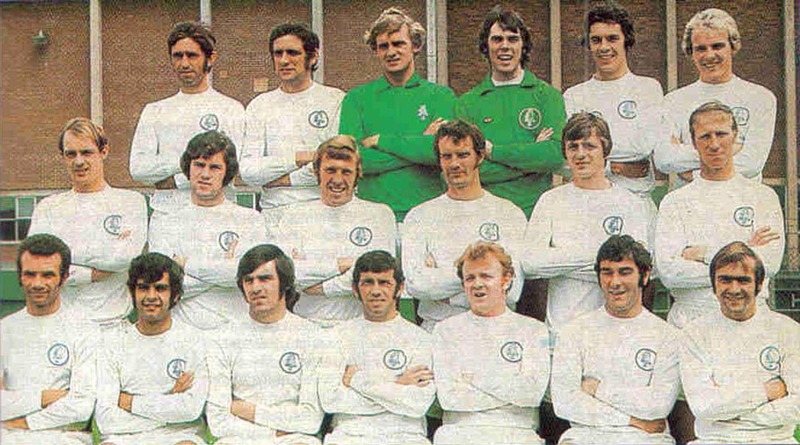 Back Row: Jack Charlton, Norman Hunter, Gary Sprake, Billy Bremner, Johnny Giles, Peter Lorimer, Mick Bates, Les Cocker (Trainer), Allan Clarke. Front Row: Bob English (Physio), Eddie Gray, Terry Yorath, Paul Reaney, Mick Jones, Terry Cooper, Rod Belfitt, Terry Hibbitt, Don Revie (Manager), Cyril Partridge (Reserves Trainer). 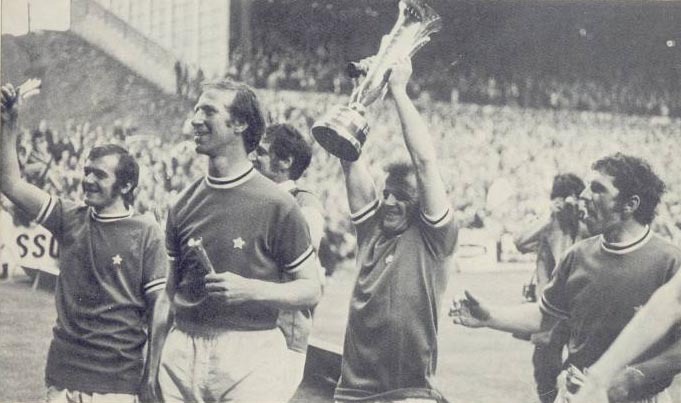 Terry Cooper, Jack Charlton, Norman Hunter, Billy Bremner and Johnny Giles display the Inter- Cities Fairs Cup to the Elland Road crowd after beating Juventus 2-6-71. 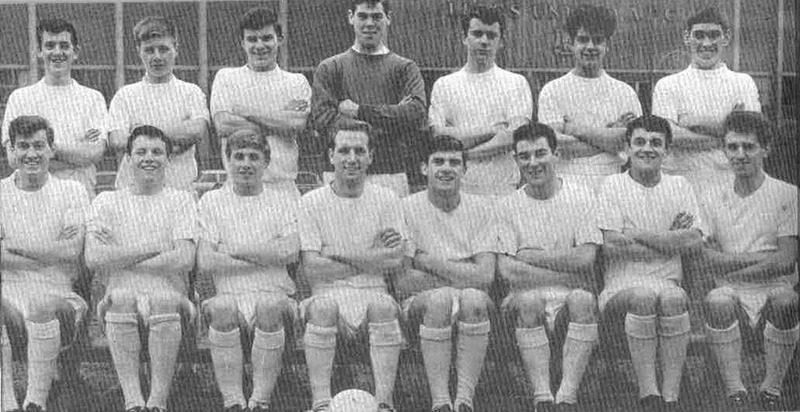 Back Row: Joe Jordan, Chris Galvin, Gary Sprake, Paul Madeley, Jack Charlton, Eddie Gray. Middle Row: Paul Reaney, Terry Cooper, Norman Hunter, Mick Bates, Johnny Giles. 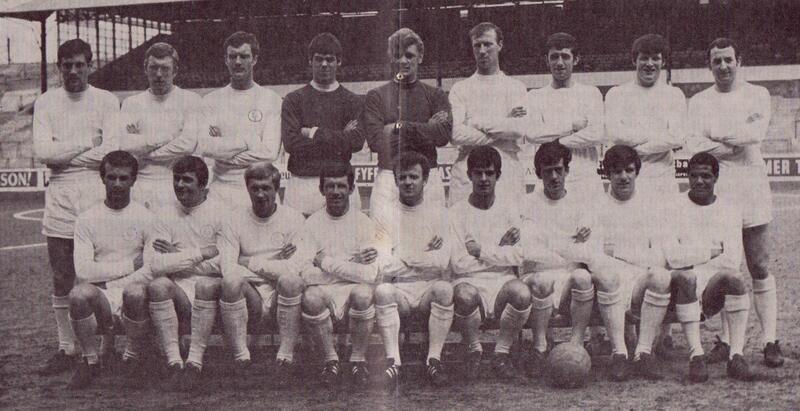 Front Row: Nigel Davey, Peter Lorimer, Allan Clarke, Mick Jones, Billy Bremner, David Harvey. 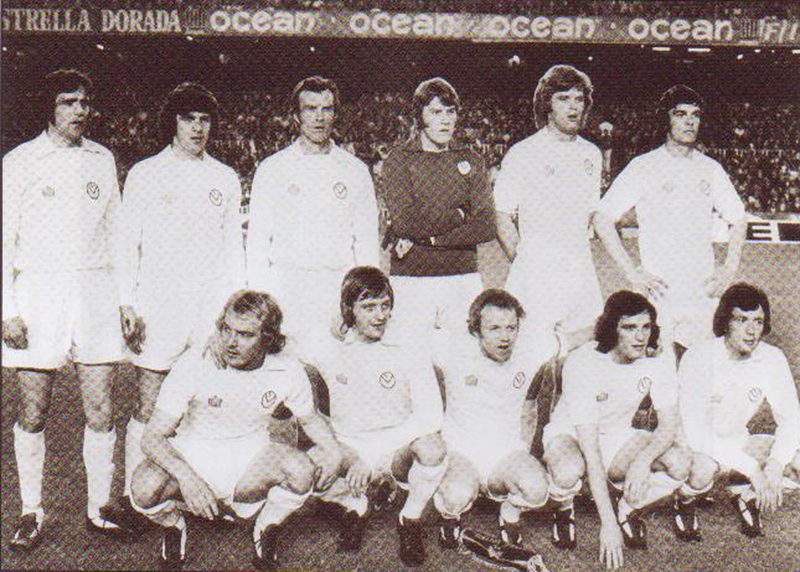 Back Row: Eddie Gray, Joe Jordan, Chris Galvin, Terry Yorath, David Harvey, Mick Jones, Norman Hunter, Jack Charlton. 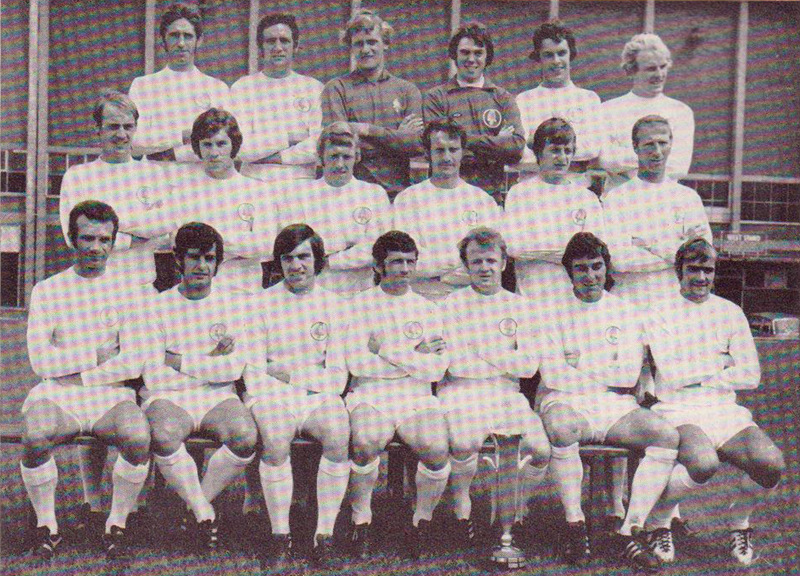 Front Row: Paul Madeley, Mick Bates, Johnny Giles, Billy Bremner, Peter Lorimer, Paul Reaney, Allan Clarke. 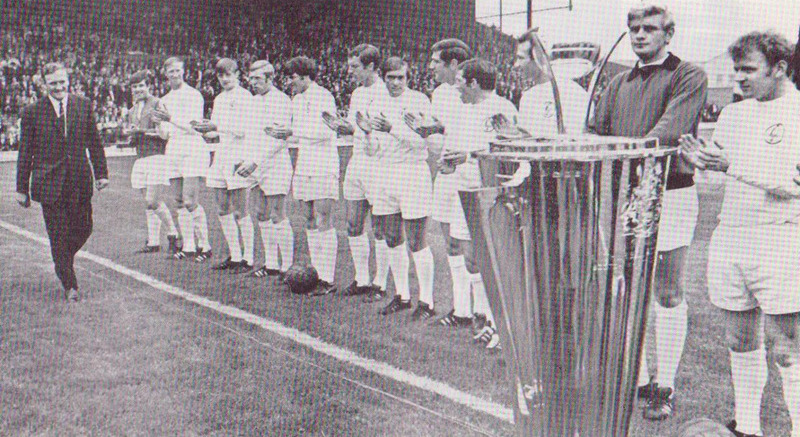 The Leeds United and Morton players applaud Bobby Collins onto the pitch in the 1971-72 pre-season Friendly at Greenock Morton, in tribute to his outstanding service to LUFC. 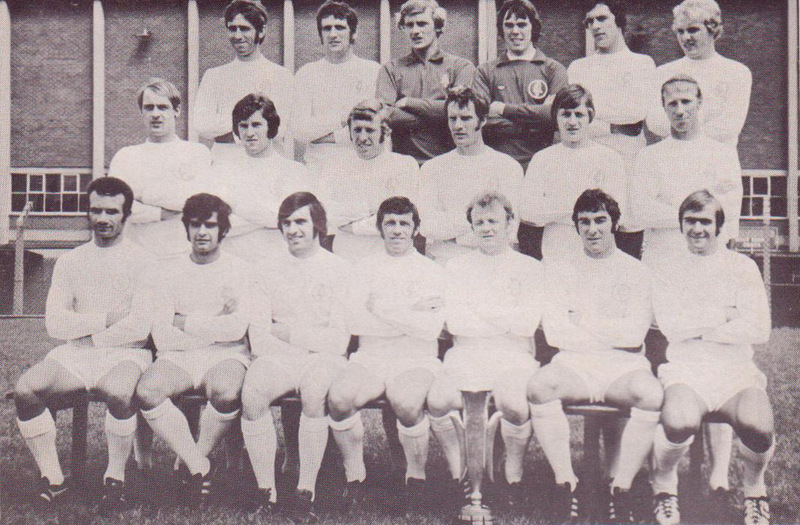 Back Row: Jack Charlton, Norman Hunter, Mick Jones, Allan Clarke, Gary Sprake, Paul Madeley, Paul Reaney. 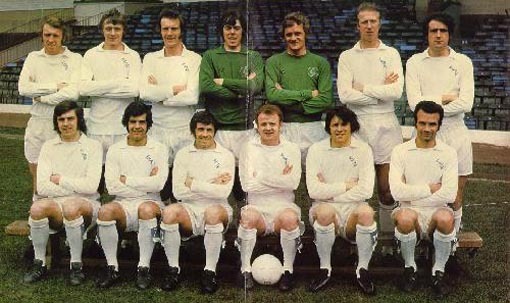 Front Row: Peter Lorimer, Johnny Giles, Terry Cooper, Billy Bremner, Mick Bates, Nigel Davey, Eddie Gray. 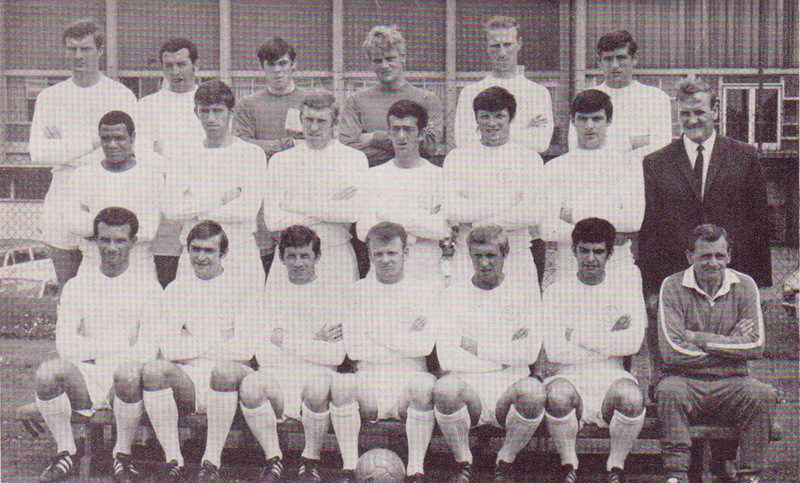 Back Row: Mick Jones, Allan Clarke, Paul Madeley, David Harvey, Gary Sprake, Jack Charlton, Norman Hunter. 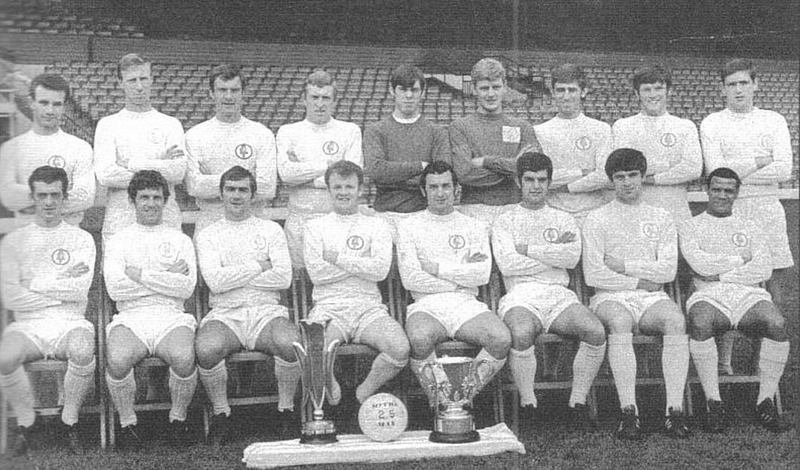 Front Row: Peter Lorimer, Mick Bates, Johnny Giles, Billy Bremner, Eddie Gray, Paul Reaney. 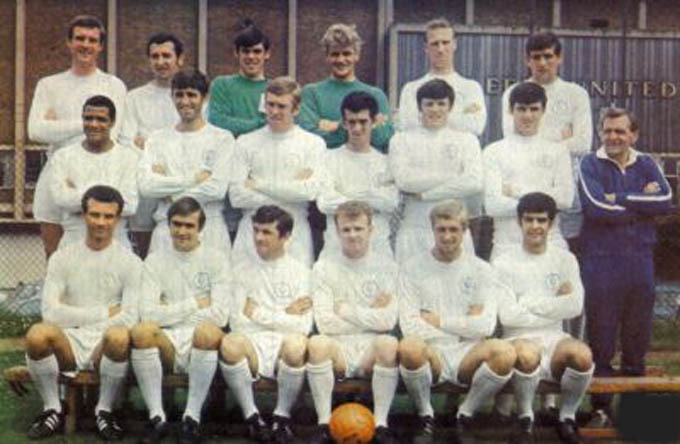 Back Row: Norman Hunter, Mick Jones, Allan Clarke, Gary Sprake, Paul Madeley, Paul Reaney. 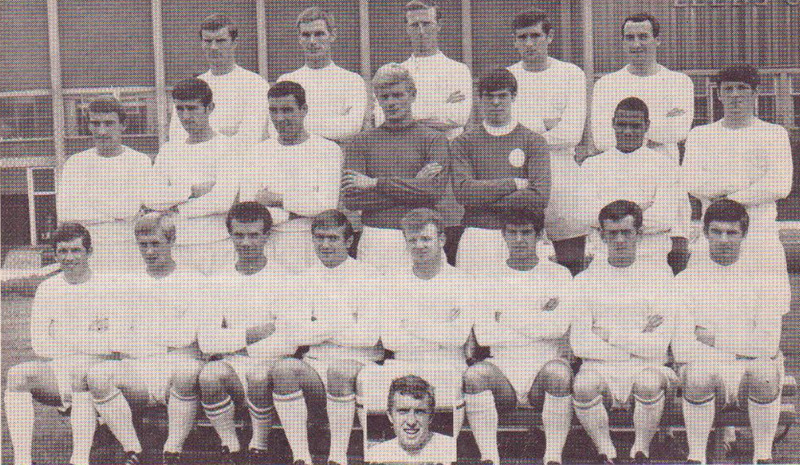 Front Row: Peter Lorimer, Johnny Giles, Terry Cooper, Billy Bremner, Mick Bates, Bobby Sibbald, Eddie Gray. Back Row: Paul Reaney, Jack Charlton, David Harvey, Mick Jones, Norman Hunter, Paul Madeley. 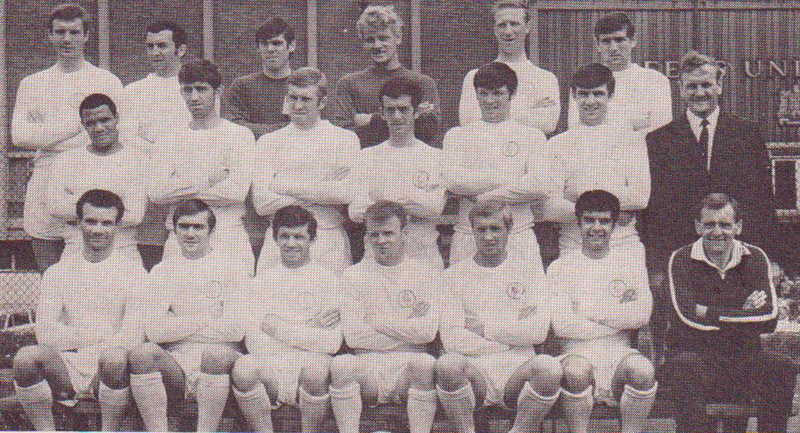 Front Row: Peter Lorimer, Allan Clarke, Billy Bremner, Johnny Giles, Mick Bates, Eddie Gray. Back Row: Paul Reaney, Roy Ellam, Chris Galvin, Joe Jordan, David Harvey, Gary Sprake, Jack Charlton, Mick Jones, Norman Hunter, Paul Madeley. 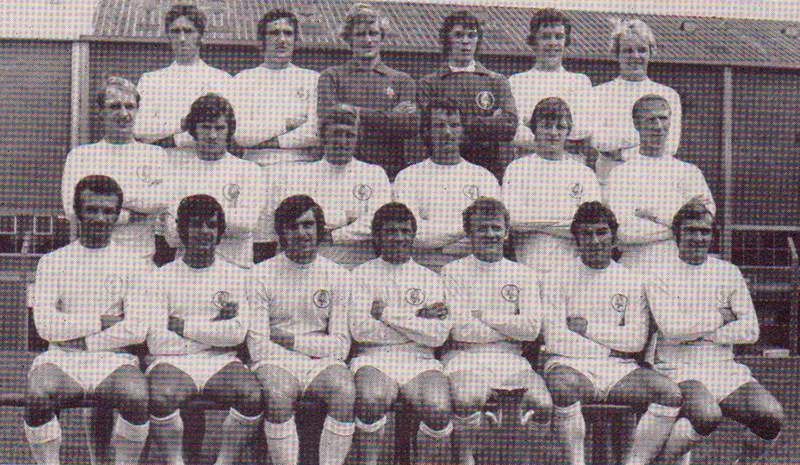 Front Row: Peter Lorimer, Allan Clarke, Trevor Cherry, Billy Bremner, Johnny Giles, Mick Bates, Eddie Gray, Terry Yorath. Mick Bates, Paul Madeley, Eddie Gray, Paul Reaney, Johnny Giles, Allan Clarke, Jack Charlton, Billy Bremner, Peter Lorimer, Norman Hunter, David Harvey. 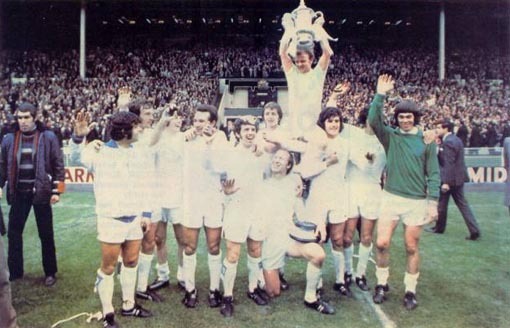 Mick Jones’ injury prevented him from joining the celebrations! Back Row: Rod Belfitt, Norman Hunter, Gary Sprake, David Harvey, Joe Jordan, Terry Yorath. 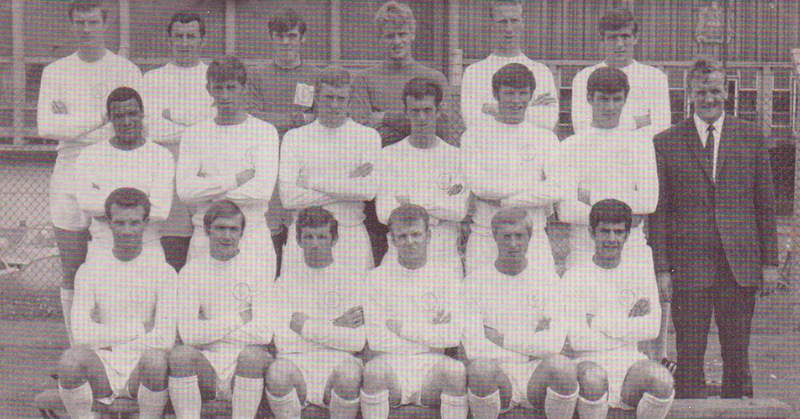 Middle Row: John Faulkner, Chris Galvin, Mick Jones, Paul Madeley, Allan Clarke, Jack Charlton. 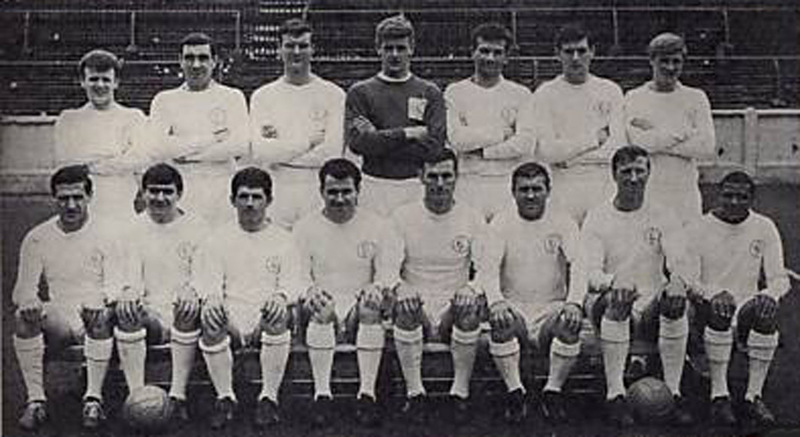 Front Row: Paul Reaney, Mick Bates, Peter Lorimer, Johnny Giles, Billy Bremner, Nigel Davey, Terry Cooper. Back Row: Terry Yorath, Paul Reaney, John Shaw, David Harvey, Gary Sprake, John Saunders, Jack Charlton. 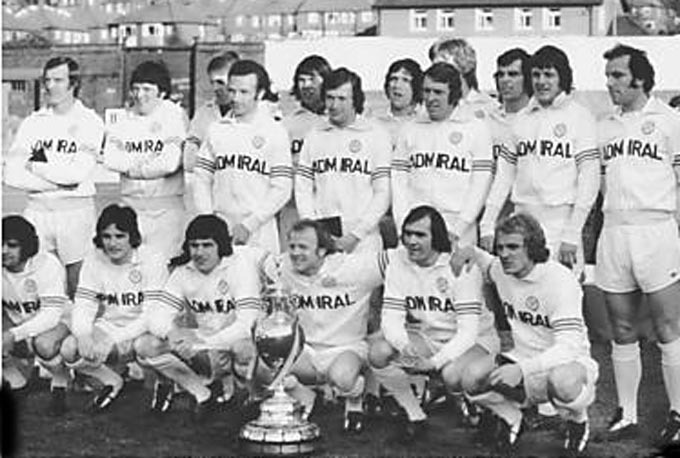 Standing: Rod Belfitt, Joe Jordan, John Faulkner, Chris Galvin, Mick Jones, Paul Madeley, Allan Clarke, M. Keith Edwards, Norman Hunter, Lee Boyd. Seated: Johnny Giles, Peter Lorimer, Bobby Rutherford, Jimmy Mann, Jon O'Donnell, Mick Bates, Billy Bremner, Nigel Davey, Terry Cooper, Jimmy O'Neill, Frank Gray. Front Row: Neil Davids, David McNiven, Tommy Brannigan, Peter Hampton, Warner Allen, Gordon Catterill, Ian Hunter, Keith Parkinson, John Taylor, Gary Liddell, Billy McGinley. 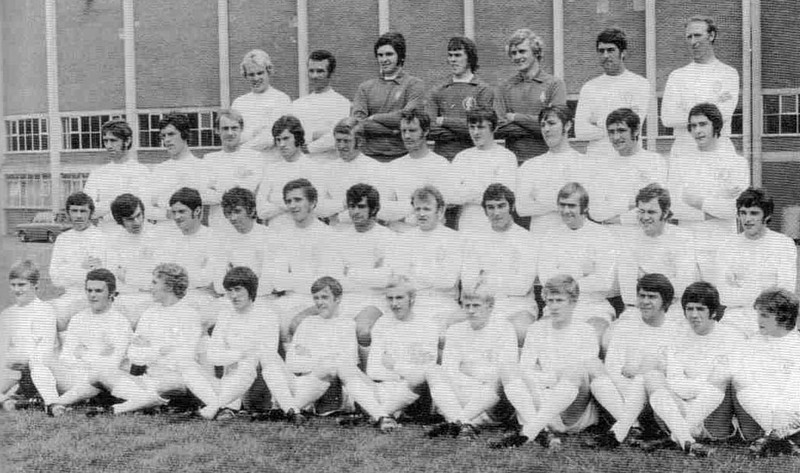 Back Row: Eddie Gray, Terry Yorath, Norman Hunter, Joe Jordan, David Harvey, Gary Sprake, Jack Charlton, Allan Clarke, Mick Jones, Paul Madeley, Terry Cooper. 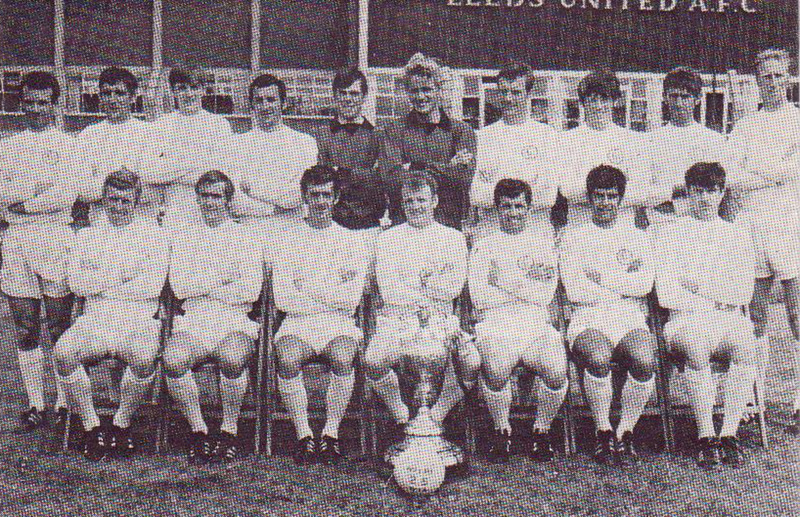 Front Row: Rod Belfitt, Mick Bates, Terry Hibbitt, Billy Bremner, Johnny Giles, Peter Lorimer, Paul Reaney. 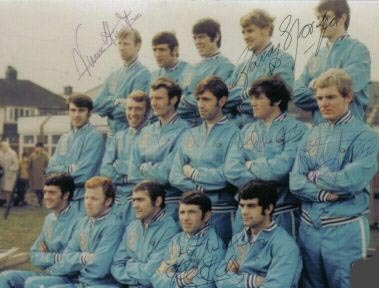 Back Row: Peter Lorimer, Eddie Gray, Mick Bates, Allan Clarke, Norman Hunter, Gordon McQueen, Roy Ellam, Paul Reaney, Frank Gray. 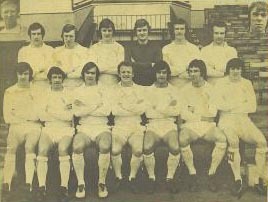 Front Row: Terry Yorath, Gary Sprake, Trevor Cherry, Joe Jordan, Johnny Giles, David Harvey, Paul Madeley, Billy Bremner, Mick Jones. 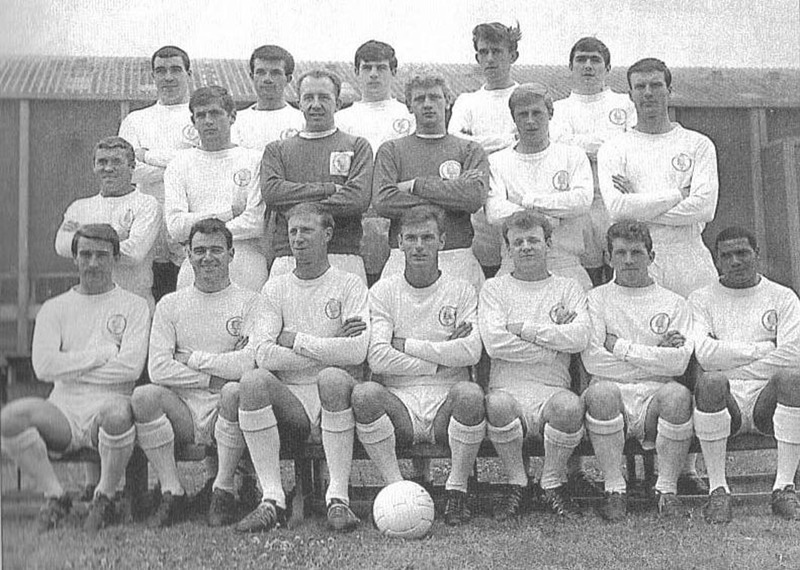 Back Row: Trevor Cherry, Paul Madeley, Mick Jones, Roy Ellam, Joe Jordan, Jack Charlton. 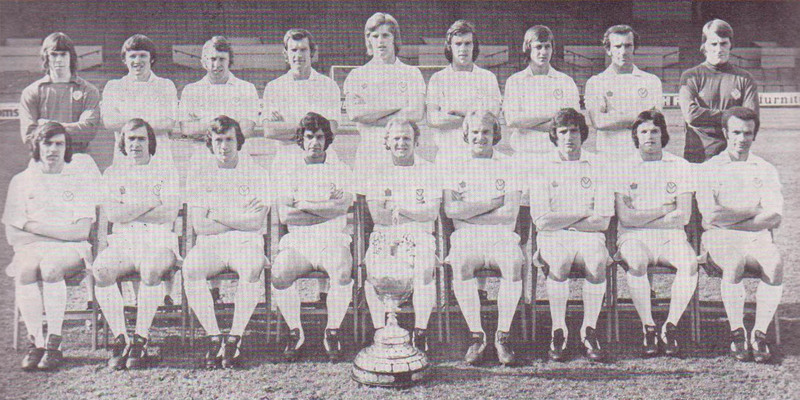 Middle Row: Paul Reaney, Chris Galvin, David Harvey, Gary Sprake, Norman Hunter, Allan Clarke. Front Row: Peter Lorimer, Johnny Giles, Billy Bremner, Mick Bates, Eddie Gray, Terry Yorath. Back Row: Robbie Shields, Gary Liddell, Joe Jordan, Keith Parkinson, David Harvey, Gary Sprake, John Shaw, Neil Parker. 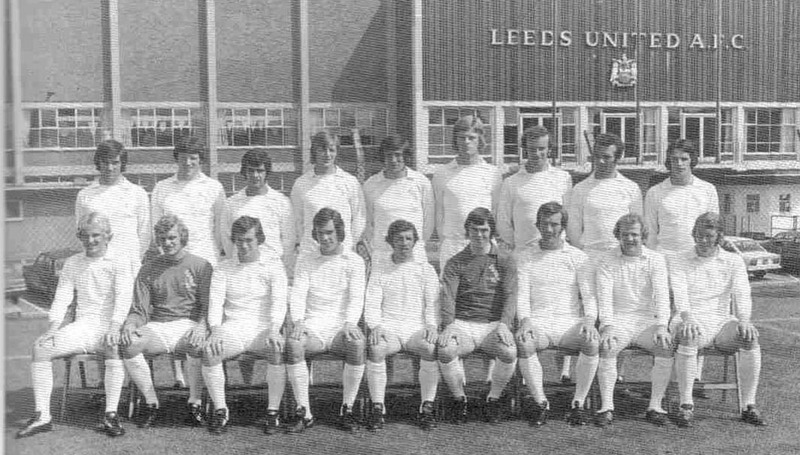 Fourth Row: Glan Letheran, Nigel Davey, Paul Madeley, Mick Jones, Roy Ellam, Chris Galvin, Jack Charlton, Norman Hunter, Allan Clarke, David Woodhall, Sean O'Neill, Gerard Hogan, Byron Stevenson. 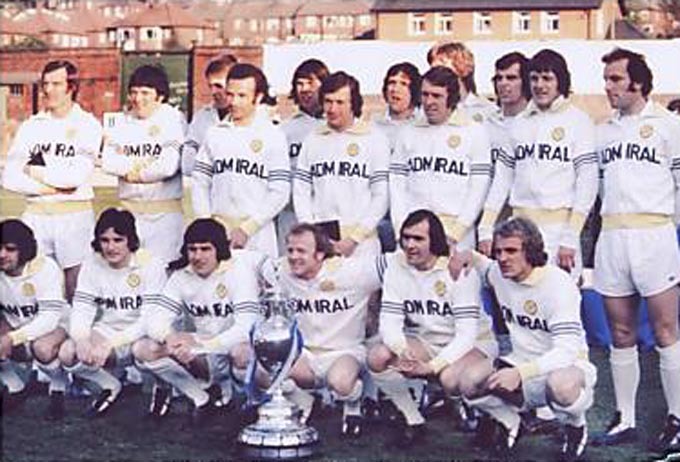 Third Row: Jimmy Wright, Paul Reaney, Trevor Cherry, Johnny Giles, Billy Bremner, Mick Bates, Terry Yorath. Second Row: Paul Brooks, Peter Lorimer, Peter Hampton, Billy McGinley, Gary Felix, Jimmy Mann, David McNiven, Frank Gray, Steve Holder, PeterTymczyszyn. Front Row: Bryan Figg, Unknown, Gordon Cattrell, Carl Harris, John Taylor, Neil Davids, Len Worthington, Derek Loadwick. 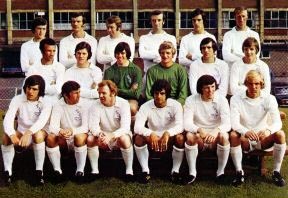 Jack Charlton, Norman Hunter, Paul Madeley, Gary Sprake, David Harvey, Mick Jones, Paul Reaney, Trevor Cherry, Mick Bates, Johnny Giles, Billy Bremner, Allan Clarke, Joe Jordan, Peter Lorimer, Terry Yorath, Eddie Gray. 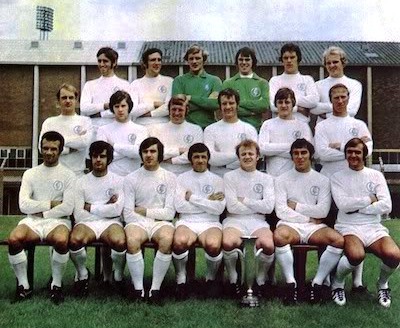 Billy Bremner, David Harvey, Paul Reaney, Johnny Giles, Norman Hunter, Trevor Cherry, Peter Lorimer, Eddie Gray, Mick Jones, Paul Madeley, Terry Yorath, Allan Clarke, Don Revie (Manager). 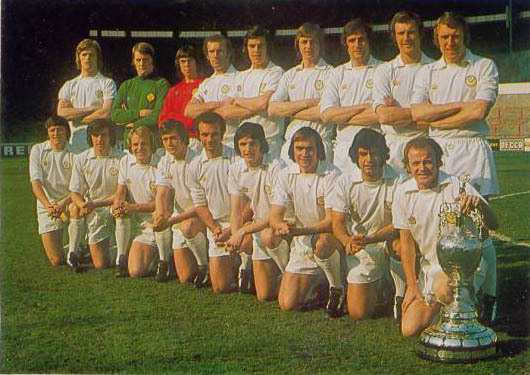 Billy Bremner, David Harvey, Paul Reaney, Johnny Giles, Norman Hunter, Trevor Cherry, Peter Lorimer, Eddie Gray, Mick Jones, Paul Madeley, Terry Yorath, Allan Clarke. Back Row: Norman Hunter, Paul Madeley, Gordon McQueen, Joe Jordan, Paul Reaney. 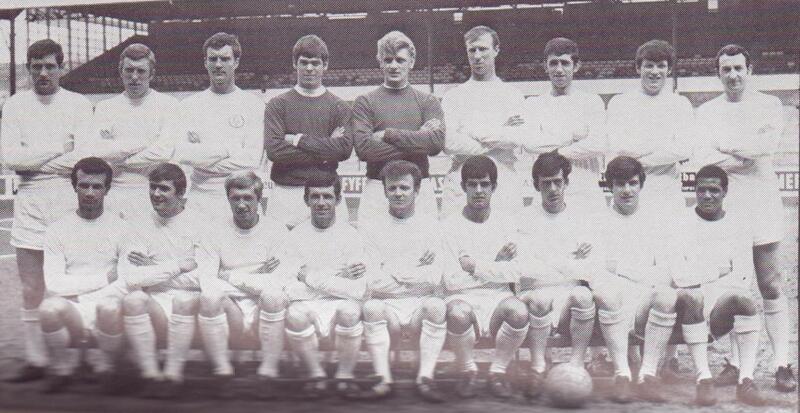 Middle Row: Roy Ellam, Allan Clarke, Gary Sprake, David Harvey, Mick Jones, Eddie Gray. 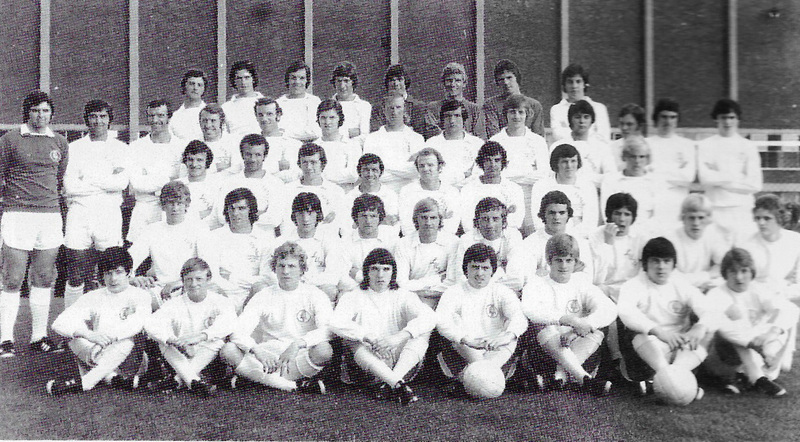 Front Row: Peter Lorimer, Mick Bates, Johnny Giles, Billy Bremner, Trevor Cherry, Frank Gray, Terry Yorath. 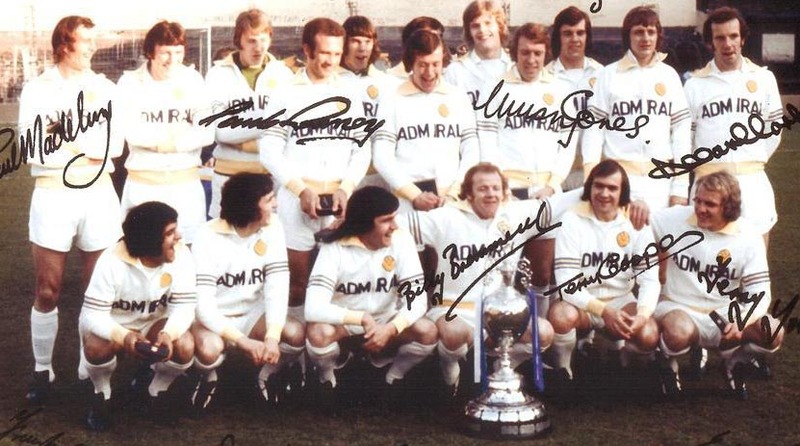 Back Row: Paul Madeley, Norman Hunter, Trevor Cherry, Joe Jordan, Gordon McQueen, David Stewart, David Harvey, Eddie Gray, Allan Clarke, Paul Reaney. 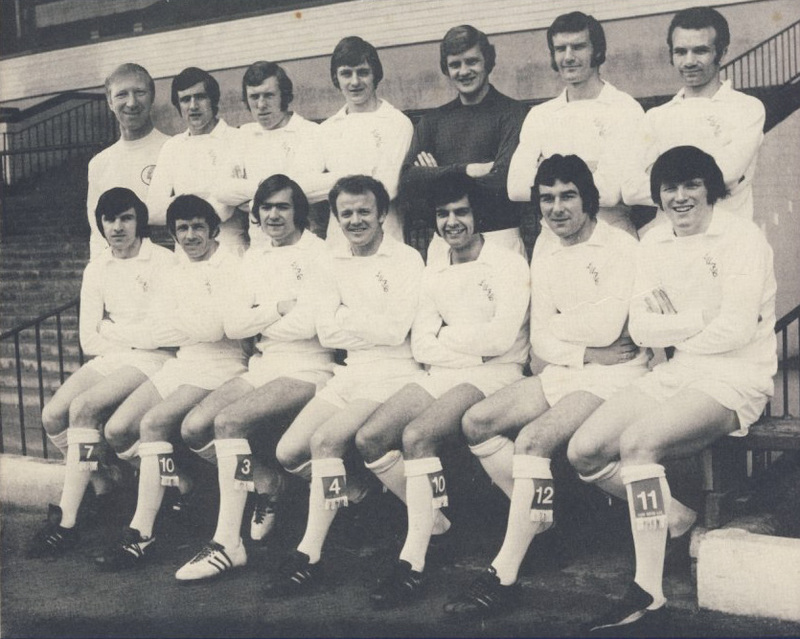 Front Row: Peter Lorimer, Johnny Giles, Billy Bremner, Terry Cooper, Mick Bates, Frank Gray, Terry Yorath. 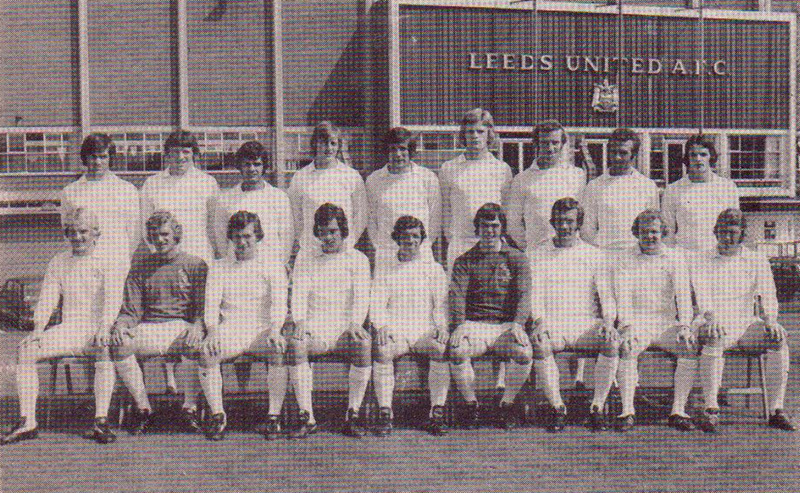 Back Row: Joe Jordan, Allan Clarke, Paul Madeley, David Harvey, Gordon McQueen, Norman Hunter, Peter Lorimer. Front Row: Mick Jones, Johnny Giles, Billy Bremner, Trevor Cherry, Terry Yorath, Paul Reaney. Back Row: David Harvey, Eddie Gray, Mick Jones, Paul Madeley, Gordon McQueen, Joe Jordan, Allan Clarke, Roy Ellam, David Stewart. 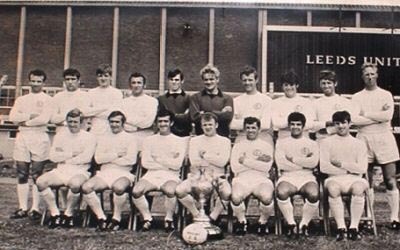 Front Row: Peter Lorimer, Terry Cooper, Trevor Cherry, Mick Bates, Billy Bremner, Terry Yorath, Norman Hunter, Frank Gray, Paul Reaney. Back Row: Gordon McQueen, David Stewart, David Harvey, Roy Ellam, Joe Jordan, Allan Clarke, Norman Hunter, Paul Madeley, Mick Jones. Front Row: Eddie Gray, Peter Lorimer, Terry Yorath, Trevor Cherry, Paul Reaney, Frank Gray, Terry Cooper, Mick Bates, Billy Bremner. Back Row: David Harvey, Joe Jordan, Eddie Gray, Norman Hunter, Gordon McQueen, Allan Clarke, Paul Madeley, Paul Reaney, David Stewart. Front Row: Frank Gray, Peter Lorimer, Johnny Giles, Billy Bremner, Terry Cooper, Mick Bates, Trevor Cherry, Terry Yorath. 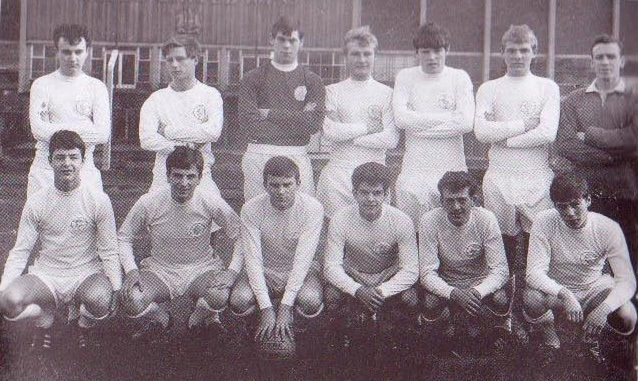 Back Row: Paul Madeley, Eddie Gray, David Stewart, Paul Reaney, David Harvey, Trevor Cherry, Norman Hunter, Gordon McQueen, Mick Jones, Joe Jordan, Allan Clarke, Roy Ellam. Front Row: Mick Bates, Frank Gray, Peter Lorimer, Billy Bremner, Terry Cooper, Terry Yorath. 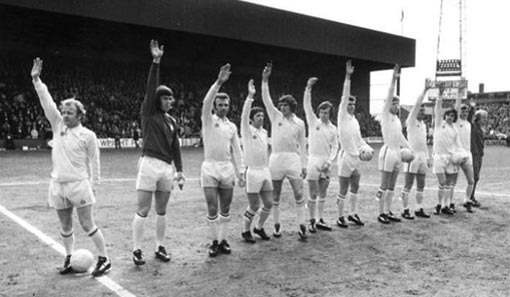 United players salute their fans: Roy Ellam, Terry Cooper, Mick Bates, Gordon McQueen, Paul Madeley, Joe Jordan, Norman Hunter, Frank Gray, Peter Lorimer, Trevor Cherry, David Stewart, Allan Clarke, Terry Yorath, Mick Jones, Billy Bremner, Eddie Gray, David Harvey, Paul Reaney. 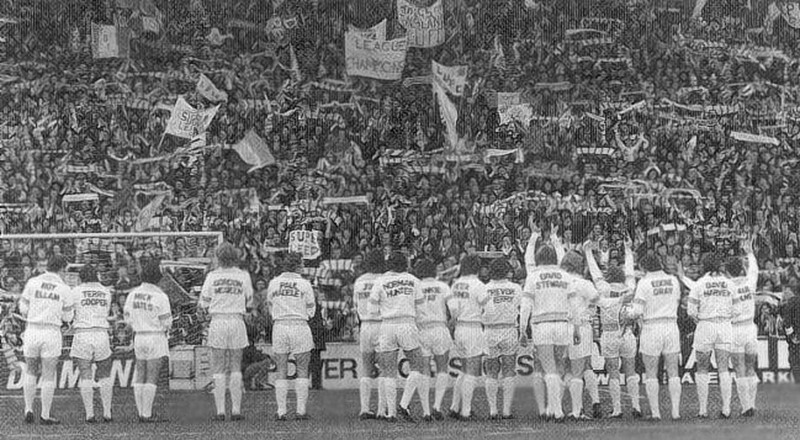 United players salute their fans prior to the Final game of the season at Queens Park Rangers: Billy Bremner, David Harvey, Paul Reaney, Johnny Giles, Norman Hunter, Trevor Cherry, Joe Jordan, Gordon McQueen, Paul Madeley, Peter Lorimer, Allan Clarke. 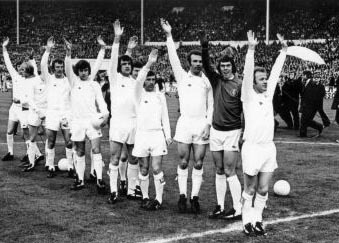 United players salute their fans prior to the Final game of the season at Queens Park Rangers: Billy Bremner, David Harvey, Paul Reaney, Johnny Giles, Norman Hunter, Trevor Cherry, Joe Jordan, Gordon McQueen, Paul Madeley, Peter Lorimer, Allan Clarke, Terry Yorath. Peter Lorimer, Trevor Cherry, Joe Jordan, Gordon McQueen, Norman Hunter, Johnny Giles, Paul Reaney, David Harvey, Billy Bremner, Brian Clough. 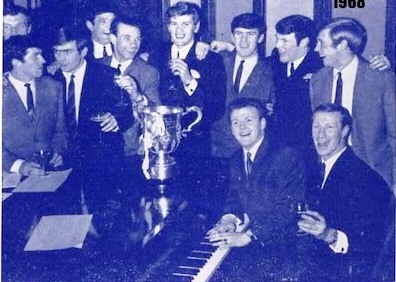 Back Row: Joe Jordan, Eddie Gray, Norman Hunter, Gordon McQueen, Allan Clarke, Paul Reaney. 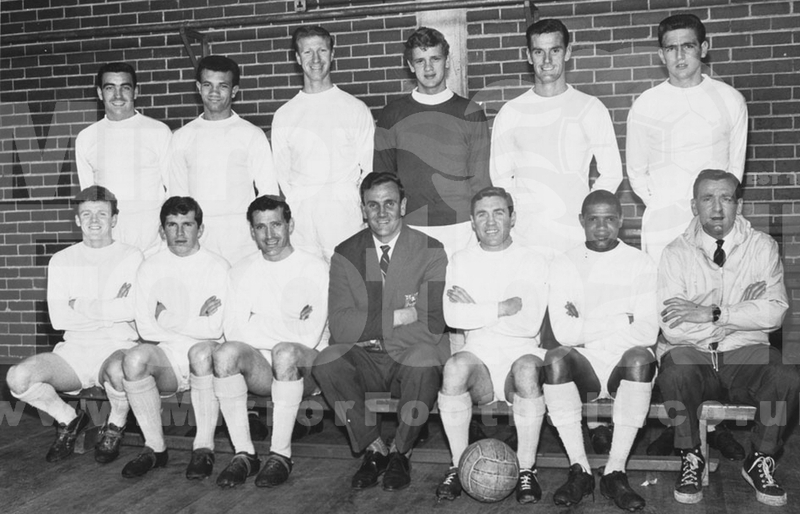 Middle Row: David Harvey, Bob English (Physio), Les Cocker (Coach/Trainer), Tony Collins (Chief Scout), Paul Madeley, Maurice Lindley (Caretaker Manager), Syd Owen (Coach), Cyril Partridge (Reserve Coach/Trainer), David Stewart. 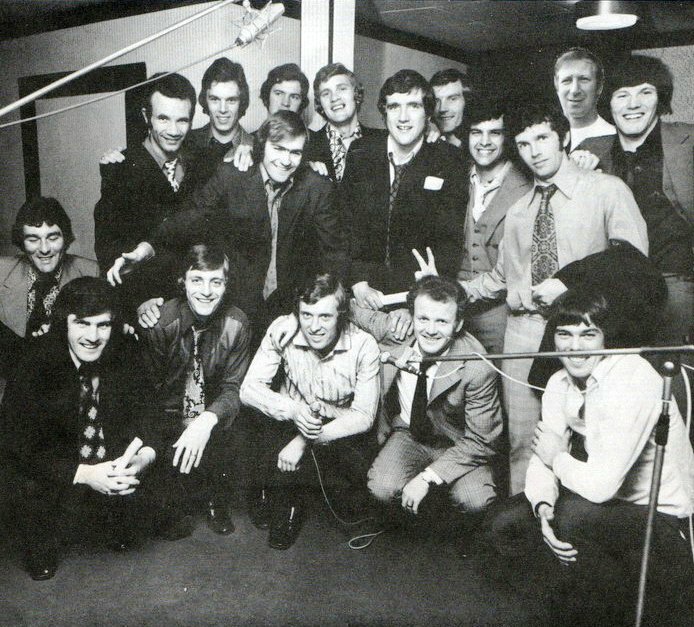 Back Row: Norman Hunter, Peter Lorimer, Paul Madeley, David Stewart, Gordon McQueen. Joe Jordan. 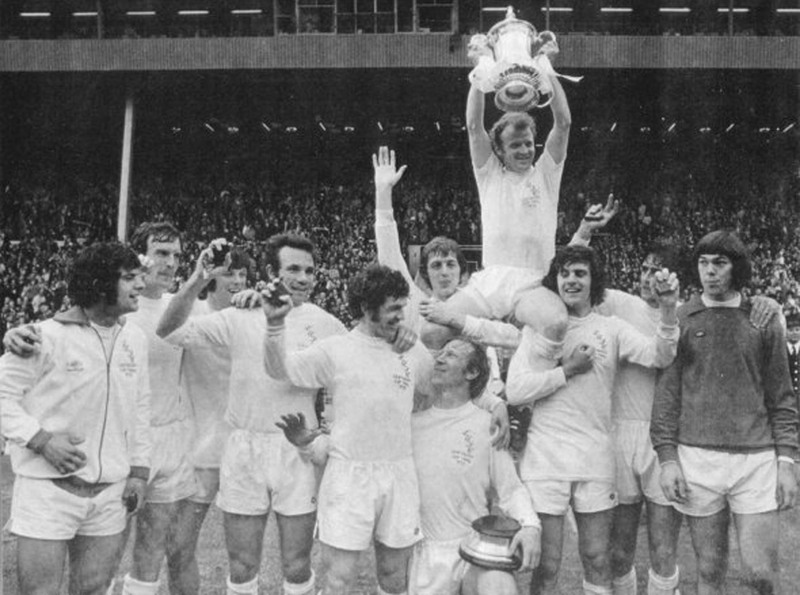 David Stewart, Paul Reaney, Johnny Giles, Norman Hunter, Frank Gray, Peter Lorimer, Joe Jordan, Paul Madeley, Terry Yorath, Allan Clarke, Peter Hampton, Trevor Cherry, Eddie Gray, Glan Letheran, Duncan McKenzie, Billy Bremner. David Stewart, Paul Reaney, Johnny Giles, Norman Hunter, Frank Gray, Peter Lorimer, Joe Jordan, Paul Madeley, Terry Yorath, Allan Clarke, Peter Hampton, Trevor Cherry, Eddie Gray, Glan Letheran, Duncan McKenzie, Billy Bremner, Unknown Official. Back Row: Neil Firm, Neil Davids, Glan Letheran, Keith Parkinson, Gary Liddell. Middle Row: Billy McGhie, Phillip Babij, Carl Harris, Peter Willis, Gerard Hogan, Derek Loadwick, Byron Stevenson, Peter Tymczysyn. Front Row: Jimmy Wright, Neil Parker, Paul Brooks, Peter Hampton, Billy McGinley, Bobby Shields, David McNiven, Gary Felix, Steve Holder. Back Row: Gordon McQueen, Joe Jordan, Norman Hunter, Paul Madeley, David Stewart, David Harvey, Allan Clarke, Eddie Gray, Paul Reaney, Terry Yorath. 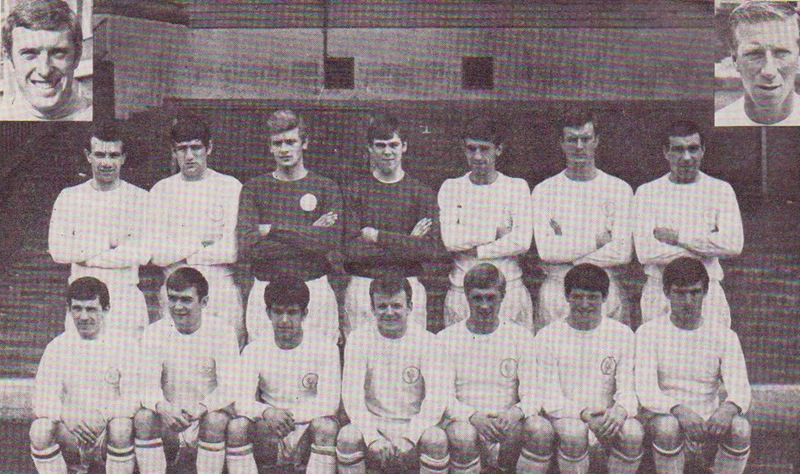 Front Row: Peter Lorimer, Mick Bates, Billy Bremner, Frank Gray, Trevor Cherry, Duncan McKenzie. Jimmy Armfield (Manager), Brian Clough (Manager), Don Revie (Manager), Mick Bates , Rod Belfitt , Willie Bell , Billy Bremner , Jack Charlton , Trevor Cherry , Allan Clarke , Bobby Collins , Terry Cooper , Nigel Davey , M Keith Edwards , Roy Ellam , John Faulkner , Chris Galvin , Johnny Giles , Freddie Goodwin , Eddie Gray , Frank Gray , Jimmy Greenhoff , Grenville Hair , Peter Hampton , Carl Harris , David Harvey , Dennis Hawkins John Hawksby , Tommy Henderson , Terry Hibbitt , Norman Hunter , Albert Johanneson , Rod Johnson , Mick Jones , Joe Jordan , David Kennedy , Ian Lawson , Glan Letheran , Gary Liddell , Peter Lorimer , Jimmy Lumsden , Paul Madeley , Jimmy Mann , Billy McGinley , John McGovern , Duncan McKenzie , Gordon McQueen , Mike O'Grady , John O'Hare , Sean O'Neill , Alan Peacock , Paul Peterson , Paul Reaney , John Shaw , Bobby Sibbald , Eric Smith , Gary Sprake , Byron Stevenson , David Stewart , Jim Storrie , Don Weston , Brian Williamson , Barrie Wright , Terry Yorath .